I am a project oriented person, as evidenced by recent foray’s into all things horror (which I actually do every year), and cultural representations of the wild west. I like learning about things by going FULL IMMERSION into them for a bit. With the recent turn of the season, I now find myself wanting to move from all things western into new, fertile, terrain. As such, my attention has now been captured by the paranormal world(s) of alternate dimensions, UFO’s, aliens, cryptids, and the bizarre occult attempts to understand and interact with them. I’ve affectionately named it the “I Want to Believe” project since it fundamentally requires copious viewing of old X-Files episodes. This week I participated in an event at the Salt Lake City and County Building put on by Utah Valley University’s Center for Constitutional Studies. They had asked if the State Archives would be willing to bring the State Constitution and put it on display as part of a program celebrating the success of the Center’s successful collaboration with Oxford’s Pembroke College on the Quill Project. Honestly, before attending I was only vaguely aware of the Center for Constitutional Studies and was completely ignorant of the Quill Project. After seeing what the students involved have pulled off consider me a huge fan! The project seeks to apply data analysis and data modeling methodologies to help better explain the complex negotiating process that takes place in the construction of a founding document. They completed work on the federal U.S. Constitution before starting in on each U.S. State Constitution (beginning with Utah). From my perspective, it was extremely gratifying to interact with a group of passionate students who were geeking out HARD on the historic records my institution has been tasked with preserving and providing access to. It was a meaningful reminder that archives are the source material of our shared collective understanding and that archival work is often cutting edge, helping facilitate projects and initiatives that have very real, very important outcomes in the world. Also, from a history nerd perspective it was pretty cool bringing the State Constitution back to the building where it was hashed out and drafted back in 1895! 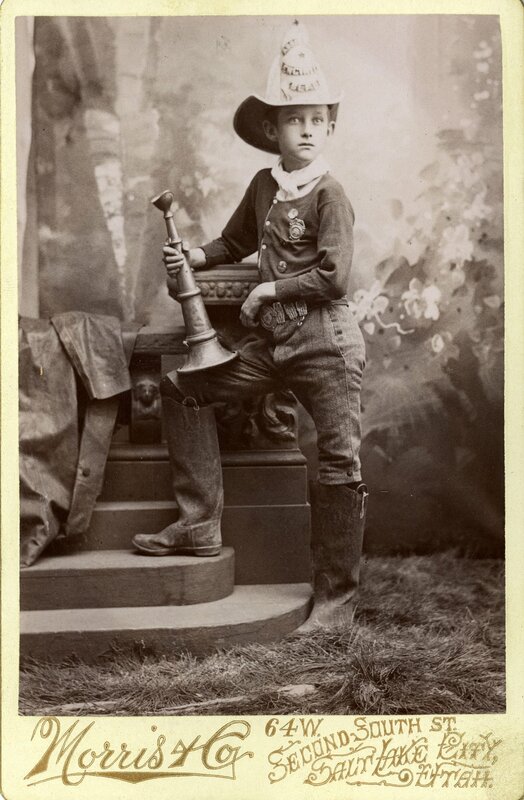 UNIDENTIFIED BOY IN FIRE FIGHTER UNIFORM (SERIES 23526). IMAGE COURTESY OF THE UTAH STATE ARCHIVES AND RECORDS SERVICE. Repurposed from a blog written in my role as an archivist at the Utah State Archives and Records Service. Salt Lake City’s first professional fire department was born in October 1883 out of the ashes of a devastating fire that occurred in the heart of the city during the summer that same year. Prior to 1883, the city had relied on volunteer fire fighting services that were organized into local brigades around the city. The first voluntary fire protection service for the city was organized in 1853 with the passage of a city ordinance that allowed for the creation of a volunteer city fire brigade. Four years later, in 1856, the Salt Lake City Volunteer Fire Department was organized and placed under the direction of Chief Engineer Jesse C. Little. This volunteer service served the city’s needs for over two decades until June 21, 1883 when a massive fire broke out at the H.B. Clawson Wagon Depot on the city block immediately south of Temple Square. As the June 1883 fire raged, the resources of the city’s volunteer fire department proved unequal to the task of effectively managing it. The situation was compounded by the fact that Clawson had illegally stored a cache of gunpowder on his property. When the fire reached this powder it exploded, simultaneously spreading the fire, and breaking much of the glass in buildings surrounding the downtown area. Once the fire was effectively contained, the losses were catastrophic. Clawson’s property was a total loss, as were the neighboring Savage Art Bazaar, the Council House, and several businesses in the vicinity of Temple Square. In response to the devastation of the June fire, the Salt Lake City Council voted and approved an ordinance in October, 1883 that established the city’s first full-time, paid fire department. 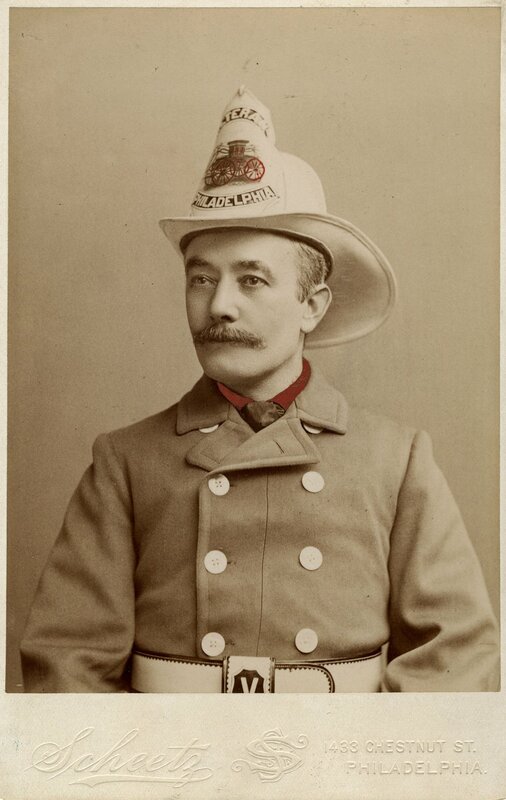 George Ottinger, who had served as the Volunteer Fire Department chief since 1876, was named the first chief of the Salt Lake City Fire Department, a position he would hold until his retirement in 1890. PORTRAIT OF H.E. KETCHUM (SERIES 23526). IMAGE COURTESY OF THE UTAH STATE ARCHIVES AND RECORDS SERVICE. With his retirement as chief of the Salt Lake City Fire Department in 1890, George Ottinger stayed active in the local fire fighting community by moving quickly to establish the Veteran’s Volunteer Fireman Association (VVFA). This fraternal organization provided a means for veterans of the city’s former volunteer brigades to remain in contact, and fraternize with members of the city’s new professional fire department. In 1904 the VVFA met for the first time in Ottinger Hall, located at 233 Canyon Road in Memory Grove, which was built for the express purpose of serving as a meeting place for the VVFA and the fire department’s Ladies Auxiliary. In addition to serving as a social space for fire fighters, the building contained one of the city’s first non-academic libraries. Over time it would also become the place where many of the artifacts and records documenting the Salt Lake City Fire Department’s history would find a home. PORTRAIT OF ED J. THOMPSON (SERIES 23526). IMAGE COURTESY OF THE UTAH STATE ARCHIVES AND RECORDS SERVICE. Upon its completion, Ottinger Hall was donated to the Salt Lake City Corporation, and leased back to the the VVFA (and later the Fireman’s Relief Association) at the cost of $1.00 per year. As the artifacts and records documenting the Salt Lake City Fire Department’s history began accumulating in the building, important questions arose of who owned these collections, and who was responsible for ensuring their long-term preservation. Was this a role for the Fireman’s Relief Association, or state government? In 1999, Salt Lake City took control of Ottinger Hall, and began the process of renovating the space for commercial use. At that time, prominent Utahn, Larry H. Miller (a descendant of the first volunteer fire chief, Jesse C. Little) was approached about the possibility of donating funds to construct a replica of Ottinger Hall at This Is the Place Heritage Park. The purpose of this new building was to house the historic artifacts and collections that had gathered in the original Ottinger Hall over time, effectively making the Utah Division of State Parks the permanent custodian of this history? Because many of the collections that had found a home in Ottinger Hall were created as a function of government activity, the Utah State Archives was asked to conduct an inventory of the historic record collections in the building. This inventory led to the transfer of several record series into State Archives custody. These records include record books, reports, bulletins, and photographs that document some of the earliest activities of the Salt Lake City Fire Department. PORTRAIT OF A. SLAIGHT (SERIES 23526). IMAGE COURTESY OF THE UTAH STATE ARCHIVES AND RECORDS SERVICE. Among the record series transferred to the Utah State Archives during the renovation of Ottinger Hall, is a collection of photographs that provide a rich visual history of the Salt Lake Fire Department from its inception in 1883 up to 1975. 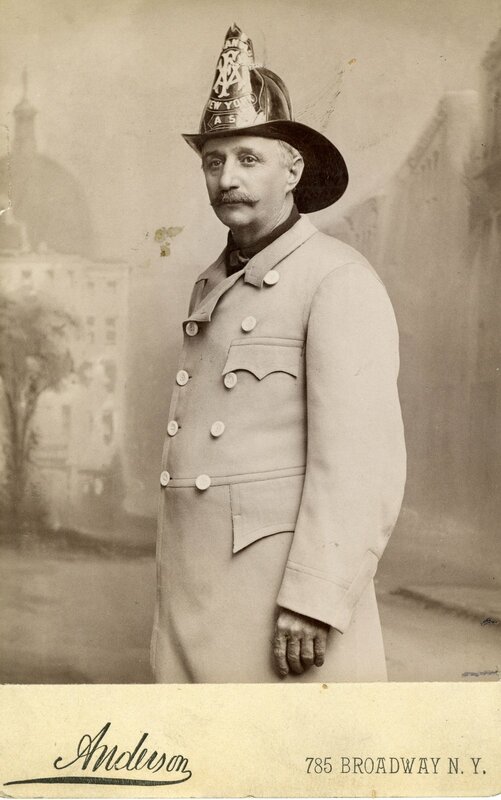 This collection includes portrait photographs from the late 19th century taken by the Shipler Commercial Photography Studio that capture the images of some of the first professional fire fighters in the city’s history. The collection also includes a photograph book that was presented to the Salt Lake City Fire Department by famed photographer C.R. Savage in 1888. Much like the Shipler photographs, these portraits provide a visual record of the first professional fire fighters to serve in the Salt Lake City Fire Department. 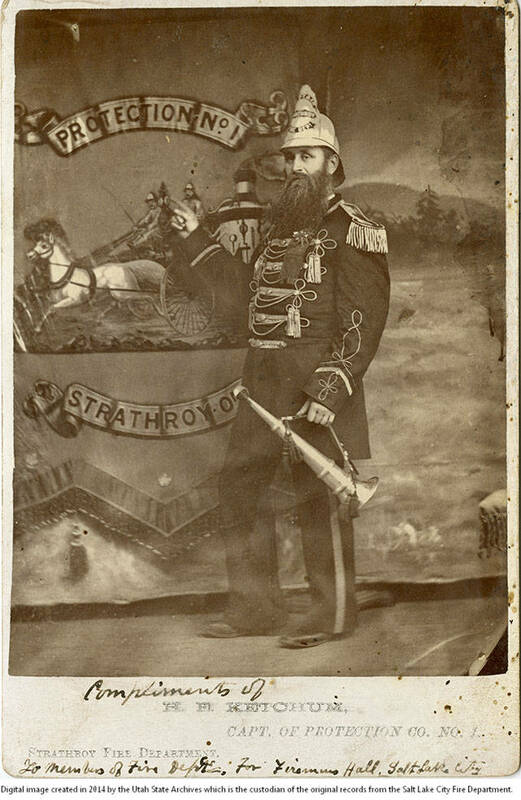 In an attempt to enhance the preservation of these historically fragile photographs, the Utah State Archives has digitized all of the earliest photographs from this collection. These images are available through the Utah State Digital Archives, and provide a tremendous resource to anyone interested in the rich history of Salt Lake City’s Fire Department. PORTRAIT OF W.S. HIGHAM (SERIES 23526). IMAGE COURTESY OF THE UTAH STATE ARCHIVES AND RECORDS SERVICE. Family photo of James Grocery with (from left to right) my grandfather, father, and the stores namesake, Uncle James. My paternal ancestors immigrated to the U.S. from Greece in the early 20th century, eventually landing in Utah. 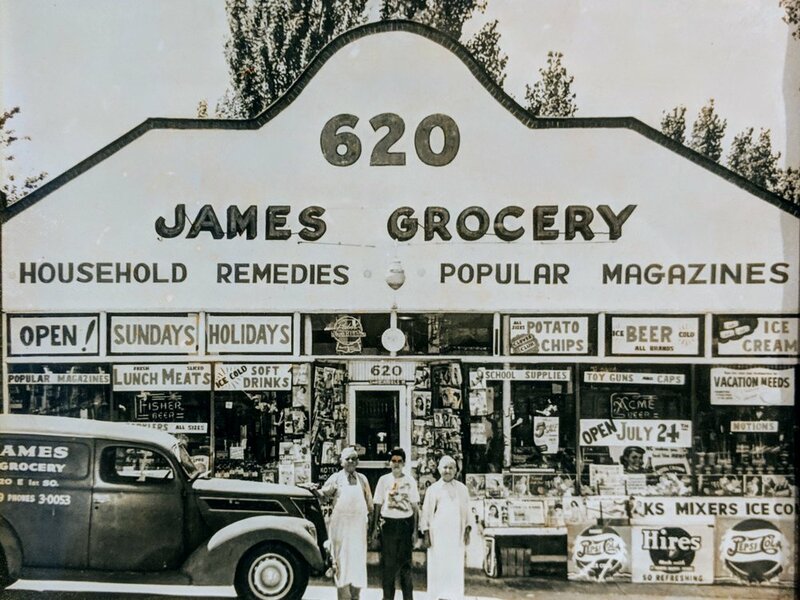 My grandfather and his three brothers made Salt Lake City home, with two of them (Uncle James and Grandpa Nick) eventually establishing the James Grocery on 620 East and 100 South in downtown Salt Lake. This is where my father was born and raised. As such, it has always held a special place in the family consciousness, in spite of the fact that its run as a grocery ended decades ago. The building still stands, virtually untouched in its design, and I have periodically driven by and thought that I should go in and introduce myself to whoever is inside and explain my family’s historical connection to the place. Well, a couple of weeks ago something very happy and unexpected happened. I was contacted by a local real estate agent who recently purchased the old James Grocery and is running his business out of it. He has fallen completely in love with the building and was doing research on its history when he came across our family name. He reached out to me to try and find out all that he can about the building, and our family’s part in its history. As such, I have planned a trip with my mom to visit with him and tour the building later today! I plan on taking lots of pictures and putting together a future post documenting the store as it was, and as it is today. This blog is part of a reference series that documents my ongoing attempt to learn and better understand my ecosystem, specifically the native trees of Utah. 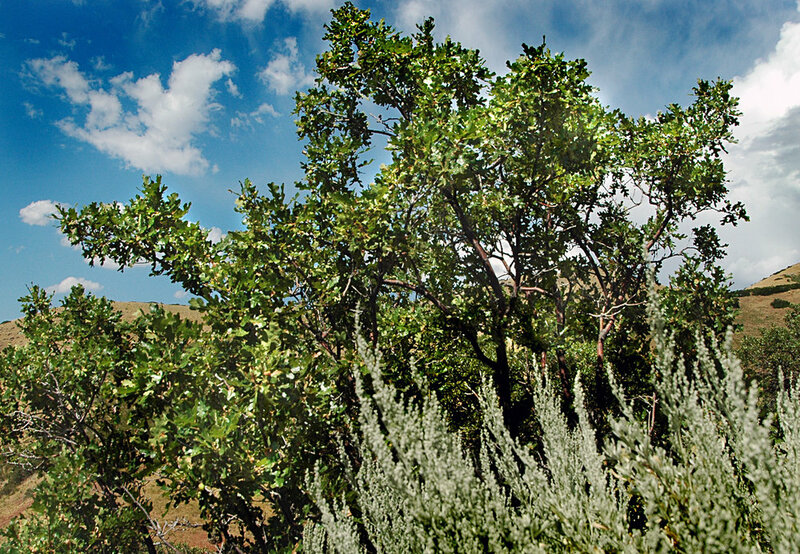 The following information on the gambel oak is taken from Utah State University’s excellent website on the range plants of Utah. Growth Characteristics: A clone forming, monoecious shrub or small tree growing 6 to 30 feet tall. Gambel oak flowers March to April, the fruits mature in the autumn of the first year after flowering. It reproduces from seed, root sprouts, and tillers. Flowers/Inflorescence: Inflorescence is a unisexual catkin. Male catkins are long and many flowered. Smaller female catkins are located at the branch apex. Fruits/Seeds: Acorns, solitary or clustered. Cup (involucre) covering nearly half of its length. The acorn is usually yellowish brown when shed in the fall. Leaves: Leaves are about 5 inches long with three or four rounded, deeply cleft lobes on each side of the central vein. The lobe tips are smooth, without spines or teeth. The leaves are bright green and shiny on top, and dull green, and hairless to slightly hairy beneath. They change in color to yellow or reddish brown in autumn when they fall. Stems: Twigs are slender, brown to reddish-brown, hairy to smooth, becoming grayish-brown. They are usually crooked or distorted. The bark is gray, deeply furrowed, and scaly. The wood is light brown, very hard, and heavy. Gambel oak is widespread at low elevations (4,000 to 8,000 feet) throughout central and southern Utah. It is a predominate tree on dry foothills and canyon walls where the rainfall averages between 12 and 25 inches each year. Better stands may be found on moist, rich, well-drained soils. The northern extent of gambel oak's range is Sardine Canyon in Box Elder County. Gambel oak has strong vegetative reproduction capabilities. In most of its range, gambel oak regeneration depends more on sprouting than establishment from seed. The large underground structure (Lignotuber) of gambel oak supports rapid and extensive sprouting following top removal. This vegetative reproduction is often dependent on disturbances such as fire and cutting. Soils: Common on all soil types, can occur from gravels to loamy sands. Associated Species: Chokecherry, arrowleaf balsamroot, bigtooth maple, ponderosa pine, serviceberry. Gambel Oak provides fair forage for all classes of livestock, as well as for deer, elk, and small wild mammals. The acorns are eaten by livestock and wildlife. The shoots contain tannic acid, and poisoning of cattle and occasionally sheep may occur from March to April. 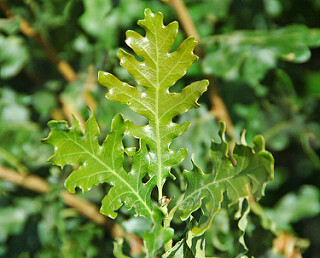 Poisoning usually occurs when gambel oak makes up more than 50% of the animals diet. Signs of poisoning include: constipation, bloody or black feces emaciation and surface swelling on the body, and dry, cracked nose. Freezing enhances the toxic properties of gambel oak. Young foliage turned black by freezing is extremely toxic. Gambel oak provides good winter habitat for mule deer and offers high cover potential for deer and other wild animals. Gambel oak has been a common source of fence posts and fuels. It is also an important plant for watershed protection. The oak woodlands are important deer winter range. The acorns of Gambel oak are edible after the tannic acid is removed. American Indians used acorns to thicken soup and make mush. 1887 PAINTING BY FRANK TRESEDER OF THE UTAH TERRITORIAL PRISON IN SUGAR HOUSE (SERIES 27827). IMAGE COURTESY OF THE UTAH STATE ARCHIVES AND RECORDS SERVICE. There are few collections in the Utah State Archives as rich and colorful as those associated with law enforcement. Through these records the escapades of both cop and criminal play out, providing dramatic snapshots of historical moments that are often tinged with high drama, emotion, and periodic violence. In 2011, Salt Lake Tribune columnist, Robert Kirby approached the Utah State Archives with the idea for a project that would promote the importance of historic law enforcement records to the various communities responsible for creating them. As an ex-police officer, Kirby has made countless contacts with various law enforcement professionals throughout Utah during his career, many of whom have long acted as the lone custodians over their individual agency histories. After a successful presentation on the value of law enforcement records in October 2011, phone calls began to roll in from far-flung offices asking how the Utah State Archives might help in ensuring the long-term preservation of Utah’s law enforcement history. One such call came from the Utah Board of Pardons, asking if the Utah State Archives would be interested in taking over the permanent care of an extremely unusual artifact: an 1887 painting of the Utah Territorial Prison that once stood in modern-day Sugar House Park. This painting had hung on the office walls of the Board of Pardons for decades, before getting reconciled to an office closet. The historic importance of this object was clear at once, and it was immediately transferred into State Archives custody for safekeeping. Using the small clues available on the painting itself, Archives staff conducted research for a finding aid, which soon revealed a back story of the artist every bit as interesting as the painting itself. Frank M. Treseder was born in 1853 in Jersey Island, England, and by the 1880s he had become well known to law enforcement officials in the Utah Territory. The first documented case of Frank Treseder running afoul of the law came in 1877 when he was brought up for trial in Salt Lake (along with Charles Howard) on the charge of robbery. According to Third District Court records, the pair had assaulted John Hepworth, robbing him of a gold watch valued at $180. Treseder was found guilty, and sentenced to three years in the Utah Territorial Penitentiary. It wasn’t long after his release from prison before Treseder once again found himself in court, this time in Ogden’s First District Court. According to court records, Treseder had been arrested (along with Meyer Seekel) for the November 24, 1881 theft of $1000 in gold coin and $500 in sundry checks from the home of Ambrose Greenwell. The pair was convicted on the charge of burglary on May 09, 1882, and Treseder would spend another three years in the Sugar House prison before his release on May 01, 1885. Not even a year passed before Treseder’s next brush with the law. On January 22, 1886 Treseder and County Collector N.V. Jones were arrested by Federal officials in the Utah Territory and charged with bribery. According to officials, Treseder had made an attempt to bribe U.S. Marshals into giving up information on raids that the government was planning on making on polygamists and unlawful cohabitants in the Utah Territory. With the impending 1887 Edmunds-Tucker Act banning the practice of polygamy in the territory, Treseder was effectively charged with acting as an agent in gathering information that might be used to help protect LDS members who would soon fall under the legal reach of the federal government for their ongoing practice of plural marriage. An interesting twist to the case came in March when Treseder (who was free on bail) was arrested again and brought before the Third District Court on charges of attempted murder. The March 02, 1886 Salt Lake Democrat reports that Treseder had approached Thomas Murray and discussed with him the potential murders of U.S. Marshal’s W.H. Dickson, E.A. Ireland, and E.A. Franks. Treseder’s attorney made a demur on this indictment, claiming that it didn’t conform to sections of the Territorial criminal code, and ultimately the charge of attempted murder against Treseder was dropped. However, on September 28, 1886 he and Jones were convicted on the original charge of bribery, and Treseder once again found himself facing a three year sentence in the state penitentiary. 1877 CHARGING DOCUMENT AGAINST FRANK TRESEDER AND CHARLES HOWARD (SERIES 9802). IMAGE COURTESY OF THE UTAH STATE ARCHIVES AND RECORDS SERVICE. The view of the prison that is now held by the Utah State Archives is one of several that have survived to the modern day. The Springville Museum of Art is known to have two Treseder Sugar House prison paintings as well, one looking to the east, and the other looking to the west. 1886 DEMUR FROM FRANK TRESEDER ON CHARGES OF ATTEMPTED MURDER (SERIES 6836). IMAGE COURTESY OF THE UTAH STATE ARCHIVES AND RECORDS SERVICE. Frank Treseder was released from the Utah Territorial Prison in the late 1880s, and promptly married a woman named Mary Bennett, whom he had met while she was visiting the prison. Domestic bliss wouldn’t last however, as Bennett would appear before the Third District Court in 1892 asking for a decree of divorce from Treseder. According to her statement he had left her, and was last known to have been seen somewhere in the Black Hills of South Dakota. The court granted her divorce from Treseder and also sole custody over their child. Information on Treseder after he left Utah is scant, but his story has an unhappy ending. According to a 1923 Texas death certificate, Treseder died alone on February 21, 1923 from paresis, with drug addiction listed as a contributing cause. Whether Treseder remained an active painter after leaving Utah isn’t known either, as no other paintings attributed to him have been identified (leaving the Sugar House prison paintings the extent of his known work at this time). However, as this story demonstrates, you never know when another unexpected discovery might be made! Ancestry.com. Texas, Death Certificates, 1903–1982 [database on-line]. Provo, UT, USA: Ancestry.com Operations, Inc., 2013. Salt Lake Democrat, “Before the Grand Jury.” Jan. 26, 1886. From Utah Digital Newspapers. http://udn.lib.utah.edu/cdm/compoundobject/collection/sldemocrat/id/48655/show/48637/rec/4 (accessed Dec. 01, 2014). Salt Lake Democrat, “Conspiracy to Murder.” Mar. 02, 1886. From Utah Digital Newspapers. http://udn.lib.utah.edu/cdm/compoundobject/collection/sldemocrat/id/58696/show/58687/rec/11 (accessed Dec. 01, 2014). Salt Lake Democrat, “Local Jots.” May 02, 1886. From Utah Digital Newspapers. http://udn.lib.utah.edu/cdm/compoundobject/collection/sldemocrat/id/16196/show/16182/rec/2 (accessed Dec. 01, 2014). Salt Lake Democrat, “Local Jots.” Sep. 28, 1886. From Utah Digital Newspapers. http://udn.lib.utah.edu/cdm/compoundobject/collection/sldemocrat/id/46791/show/46770/rec/30(accessed Dec. 01, 2014). Salt Lake Herald, “Out on the Hill.” Apr. 13, 1886. From Utah Digital Newspapers. http://udn.lib.utah.edu/cdm/compoundobject/collection/slherald18/id/78855/show/78830/rec/73 (accessed Dec. 01, 2014). Salt Lake Herald, “Her Romance Ended.” Apr. 30, 1892. From Utah Digital Newspapers. http://udn.lib.utah.edu/cdm/compoundobject/collection/slherald19/id/120218/show/120181/rec/75 (accessed Dec. 01, 2014). Swanson, Vern G. Utah Art, Utah Artist – 150 Years Survey. Layton: Gibbs Smith, 2001. Print. Utah State Archives and Records Service. Board of Pardons. Utah Territorial Prison Painting. Series 27827. Utah State Archives and Records Service, District Court (First District), Northern division civil and criminal case files, Series 1529. Utah State Archives and Records Service, District Court (Third District), Territorial criminal case files, Series 6836. Utah State Archives and Records Service, District Court (Third District), Case files, Series 9802. This blog is part of a series that documents my personal goal to summit all of the high county peaks in Utah. GETTING TO THE TRAILHEAD: “Drive east from Evanston, Wyoming, on I-80 for 35 miles, then take exit 39 south onto Highway 414. Drive south on Highway 414 for 6 miles to the town of Mountain View, where you must turn right on Highway 410 towards the farming village of Robertson. 6.8 miles from Mountain View, just before you reach Robertson, you will come to a junction where Highway 410 makes an abrupt bend to the west and a wide gravel road continues straight ahead to south. Continue south at this point on the gravel road. 12.3 miles after leaving the highway you will come to a major fork in the road. The right fork leads to China Meadows while the left fort leads to Henrys Fork Trailhead. Bear left at this point and continue for another 10.7 miles, following the signs to the Henrys Fork Trailhead.” (From Utah’s Incredible Backcountry Trails by David Day). NOTES: Kings Peak is named after Clarence King who oversaw the U.S. Geological Exploration of the 40th parallel that began in 1867. As part of that exploration, the High Uinta Mountains were mapped by S.F. Emmons, in 1869 and 1871. 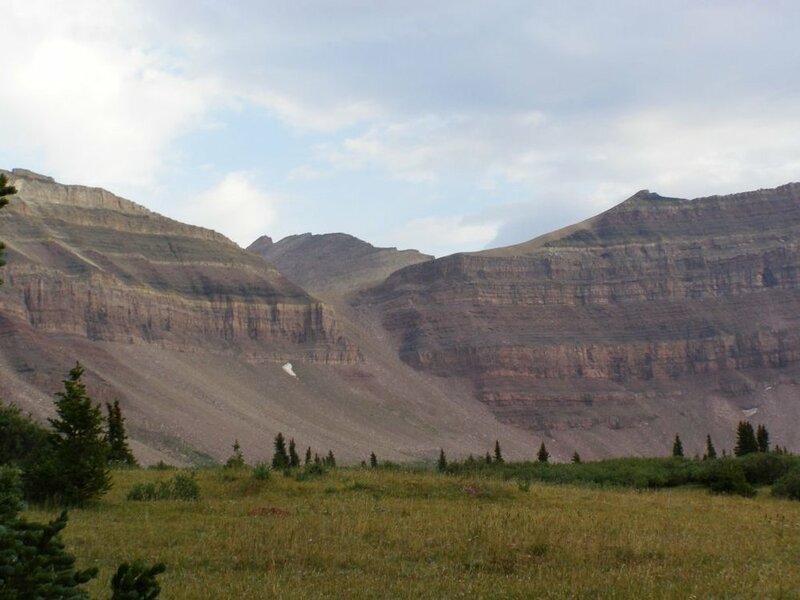 For most of its recorded history, Kings Peak was not recognized as the tallest peak in Utah. 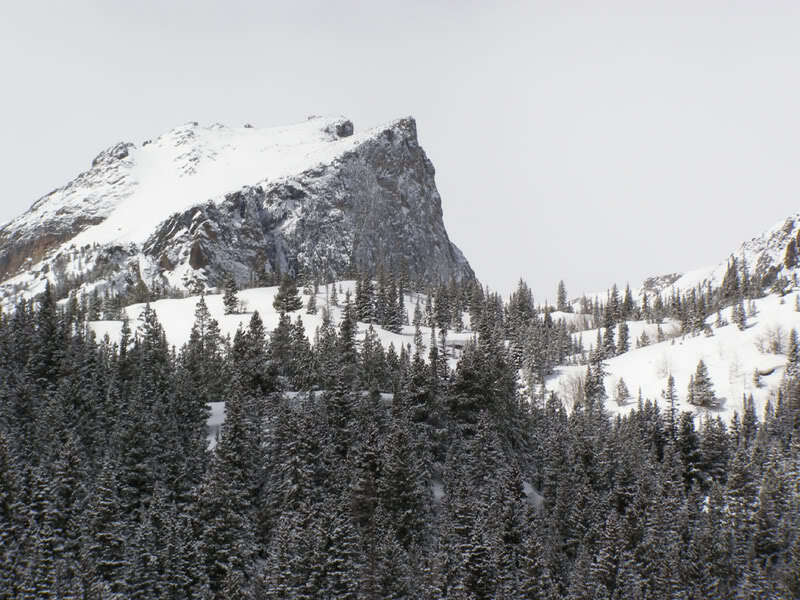 Inaccurate news stories in the early 20th century designated Emmons Peak (also in the Uintas) as the highest, and then Kings Peak neighbor, South Kings Peak, before the true high summit was officially recognized by the U.S. Forest Service in the 1970’s. Kings Peak towering over the Anderson Pass. I have now had the opportunity to climb Kings three different times. Each was done via the Henrys Fork Trail which gently guides backpackers into the rolling, stunningly beautiful Henrys Fork Basin. Once in the basin there are a lot of hiking options, though the most efficient method I have found is to aim for Dollar Lake to set up camp the first day. The stirring scenery at Dollar Lake. Approaching Kings Peak from Dollar Lake offers two options. The first is to make for the sheer wall of the Anderson Pass (with Kings Peak towering above it). I took this route up and back on my 2007 trip, and up again on my 2013 trip. It is difficult and dangerous, but it does offer the fastest access from the basin. The longer route sticks to the the trail near Dollar Lake that gradually makes its way up and over Gunsight Pass and into the Painter Basin. Taking the rambling long way around the Painter Basin adds extra mileage to the trip, but the scenery is well worth the extra effort. Hikers have created a shortcut near the top of Gunsight Pass that follows a ridge line that works its way above the Painter Basin (and keeps you out of the basin altogether). On my 2015 trip, Sarah and I took the longer route up Kings after failing to find the shortcut access at Gunsight Pass. We had better luck on the way down and it was fairly obvious once we were able to see it from a different perspective. Closer view of the Anderson Pass. Regardless of how you access it, all roads end at the base of Kings Peak. From there it is a rock-hopping, boulder-jumping slog across the final ridge and up to the summit. There are numerous false summits along the way, which can get super frustrating, particularly as the air starts to thin out at high elevation. The summit itself is well fortified with wind breaks and rock shelters and the panorama features panoramic views of other 13,000’-ers, lakes, and more rugged High Uinta basin drainage’s. On all three of my trips clouds rolled in at some point, either on top of (or coming down) the peak. Weather moves fast and the sound of rolling thunder takes on particularly ominous tones at high elevation. Luckily I never felt compelled to use the Anderson Pass as a quick emergency exit strategy to get back to camp, as it seems much sketchier going down than coming up. The base of the Kings Peak summit seen from the top of the Anderson Pass. A Kings Peak trip really highlights everything that makes backpacking and peak bagging in the Uinta’s so worthwhile. It can get heavily trafficked, so would-be adventurer’s should aim for off time’s whenever possible. Also, based on past experiences I would recommend taking three days for the trip. On the 2007 trip I did it in two, packing up camp and heading out after the climb was complete. 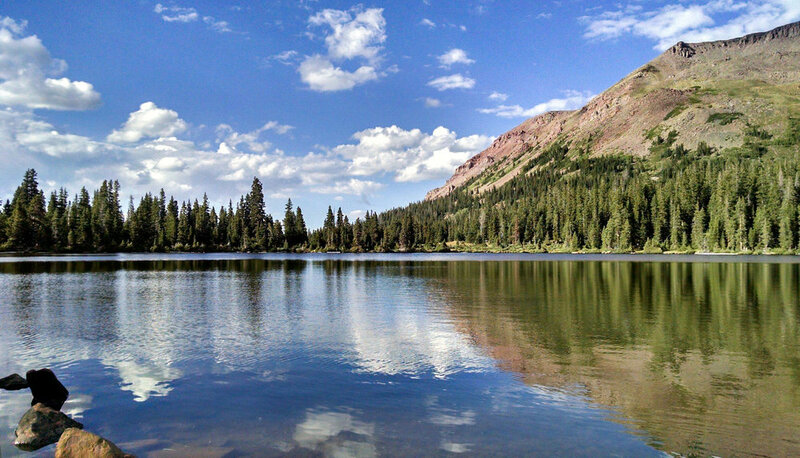 However, doing so robs you of the opportunity to sit in camp, revel in the scenery of Dollar Lake, and reflect on the accomplishment of making to the top of Utah. The final stretch on the way up to the Kings Peak summit. ILLUSTRATION OF UTAH’S FIRST TERRITORIAL STATEHOUSE IN FILLMORE. IMAGE COURTESY OF THE UTAH DIVISION OF STATE HISTORY. The first legislative assembly in Utah’s history was convened in Salt Lake City on September 22, 1851. Over the course of six months, 13 members of the Territorial Council and 26 members of the Territorial House of Representatives passed a series of acts and bills that formally codified the first laws of the Utah Territory. 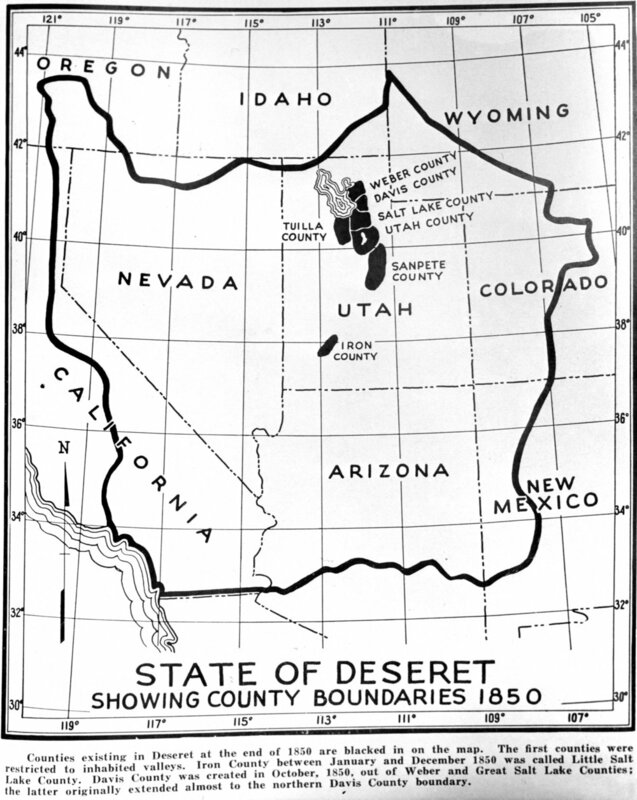 The Utah Territory had been established by an act of the U.S. Congress on September 09, 1850, after a failed March 08, 1849 petition by Utah leaders to create a new state named Deseret. When the petition for the state of Deseret was submitted, the first Mormon settlers had been in region for nearly two years (having arrived in the Salt Lake Valley in July 1847). At the time of Mormon settlement in Salt Lake, the U.S. government was in the midst of the Mexican American War. U.S. Victory in this conflict would eventually lead to Mexico ceding large chunks of western North America over to federal control. UTAH TERRITORY WITH DESERET BORDER - LICENSED UNDER CC BY-SA. PHOTO COURTESY OF THE UTAH STATE ARCHIVES AND RECORDS SERVICE. The designation of the Utah Territory by Congress was part of a much larger set of bills passed that would come to be known as the Compromise of 1850. This “compromise” attempted to maintain a balance of power between free states and territories and slave states and territories in the Union. As part of complex package of legislation, California was admitted into the Union as a free state, while the territories of Utah and New Mexico were admitted under the provision that slavery in each territory would be decided by the popular sovereignty of its citizens. 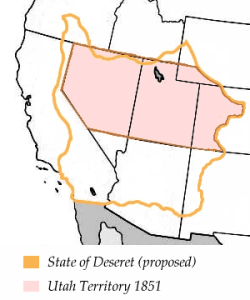 With the designation of the Utah Territory, the size of Deseret was dramatically scaled back. Mormon leaders had originally called for a state that would have encompassed all of the Great Basin, the entire Colorado River Drainage Basin, and an outlet to the Pacific Ocean running through San Diego. Instead, the new territory was scaled back to include much of modern-day Utah, Nevada, and parts of Wyoming and Colorado. In addition, legislation creating the territory called for the designation of territorial officials, the formation of a territorial legislative assembly responsible for enacting laws and a civil code for the territory, and the creation of a territorial judiciary. On February 03, 1851, Mormon church president, Brigham Young was designated as the first Territorial Governor of the Utah Territory, and by September of that year, the 13 members of the Territorial Council (with Willard Richards as president) and 26 members of the Territorial House of Representatives (with William W. Phelps as speaker) had been chosen and met to conduct the business of Utah’s first legislative session. 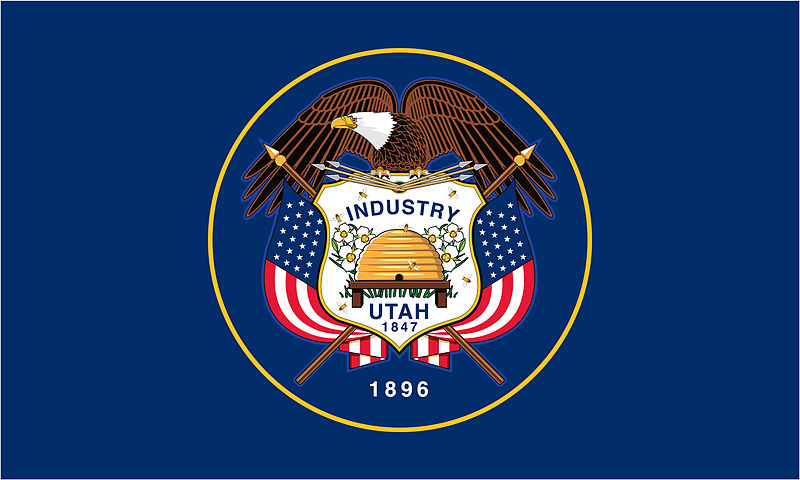 Between September 1851 and March 1852, the first legislative assembly in Utah’s history met in Salt Lake City and enacted Utah’s first set of formally recognized laws. Much of the work done by this legislative body came out of efforts that had already been made in drafting a proposed legal code for the failed State of Deseret. The Utah State Archives holds the records from this first legislative session. Examples from this series reveal the scope and variety of laws debated and passed by Utah’s first Territorial Legislative Assembly. AN ACT AFFIRMING SALT LAKE CITY’S CHARTER (SERIES 3150). PHOTO COURTESY OF THE UTAH STATE ARCHIVES AND RECORDS SERVICE. AN ACT GRANTING MILL CREEK WATER RIGHTS TO BRIGHAM YOUNG (SERIES 3150). PHOTO COURTESY OF THE UTAH STATE ARCHIVES AND RECORDS SERVICE. A third act demonstrates the lengths the Territorial Legislative Assembly went to provide social order in the new territory. This, “act in relation to the inspection of Spirituous Liquors,” serves as the first piece of liquor control legislation in Utah’s history. It established an office of Territorial Liquor Inspector, mandated the methods for determining alcohol levels, and establishes fines for anyone caught selling contraband liquor in the territory. 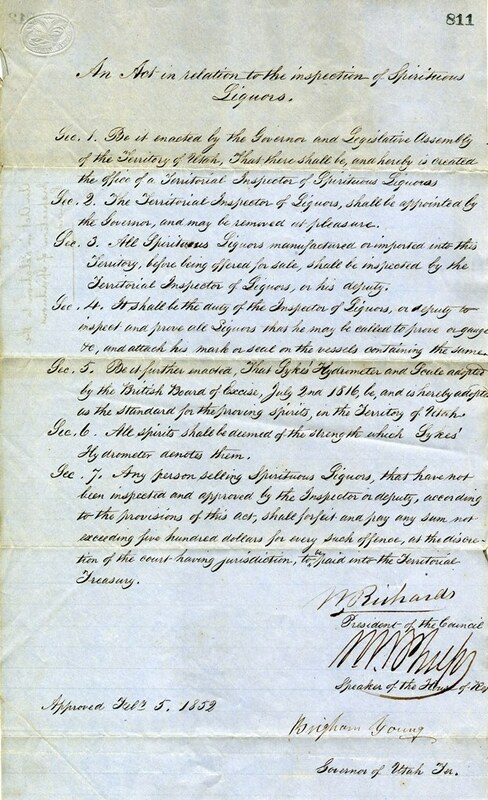 AN ACT ESTABLISHING UTAH’S FIRST LIQUOR INSPECTOR (SERIES 3150). PHOTO COURTESY OF THE UTAH STATE ARCHIVES AND RECORDS SERVICE. 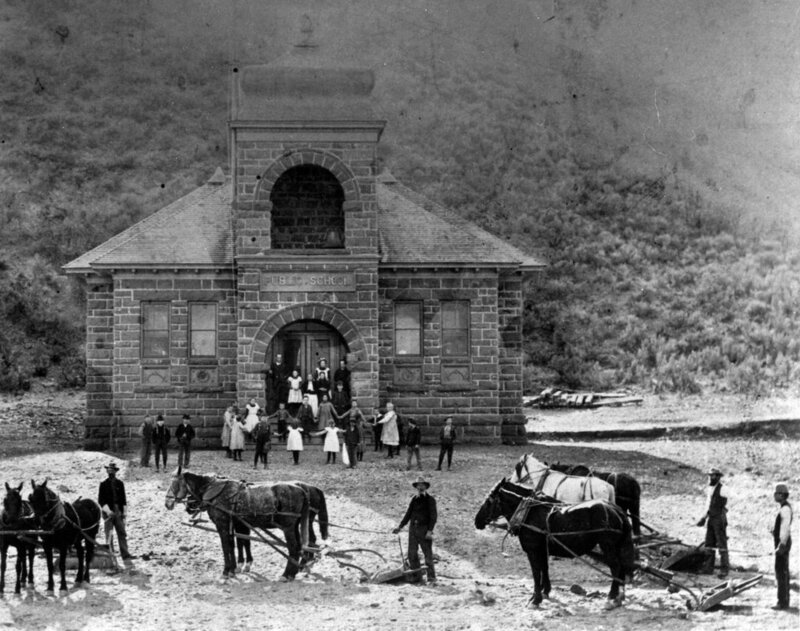 These examples, all signed by powerful Mormon leaders acting in a secular government capacity, show just how intertwined church and state were in the early history of the Utah Territory. In the coming years this dynamic would shift as outside, non-Mormon populations began to settle in the territory and call it home. With increased federal influence, national westward expansion, mining booms, and eventually the birth of an intercontinental railroad system, the hold over government held by Brigham Young and other Mormon leaders would incrementally lessen over the years, though the influence the Mormon Church would wield over local affairs remained very much in tact. The legislative records of Utah tell the story of this growth and the profound changes that would come to the Utah Territory as it evolved towards eventual statehood in 1896. Today the Utah State Archives preserves and provides access to a vast collection of historic records documenting Utah’s legislative history. In addition, the Utah State Legislature has made many of the records related to contemporary legislation freely accessible to the public through the Legislative website. The Utah Legislature and Utah State Archives have also made a variety of useful guides available online that help explain the complexity of the legislative process, as well as how researchers can draw on historic legislative records to conduct important research, such as the discovery of legislative intent. An effective democracy relies on the checks and balances placed upon its representatives by informed citizens. The Utah State Archives and the Office of Legislative Research and General Council serve as important government agencies in terms of promoting this ideal and ensuring that transparency remains an unassailable part of Utah’s annual legislative process. Upon completing my MLIS degree in 2016, I decided to give our family a graduation present in the form of a small vinyl record player. I had accumulated a tiny (like, four or five) collection of vinyl records and thought that it might be fun to periodically play them for everyone in the house to enjoy. Cut to two-plus years later and Sarah and I are glorified vinyl geeks who pay frequent visits to Graywhale (while also making it a point to seek out local record shops whenever we travel). First is the sheer physicality of vinyl. Records are substantial things. They take up space and (like a book collection) their presences provides a definite window into the interior world of the collector. They are also deeply contextual with sleeves that contain album art and metadata that reflect the army of folks it took to produce and capture a specific set of sounds in a specific time and place. My second insight into the thrill of vinyl has to do with the joy of discovery itself. Going to record stores on the hunt for an unexpected find is pretty damn fun. It is something I remember from my formative years, first in the hunt for basketball cards, and then, later, CD’s. Finally, I have come to enjoy (and actually rely on) the distinct difference in the listening experience that comes with vinyl. Unlike digital, which offers an overwhelming (exhaustive) number of choices to jump around in, a vinyl record by its very nature forces you to sit and consider the music in one continuous piece, just as the musician composed and arranged it. It is a slow process that has reaffirmed to me that for all of the convenience afforded by digital media, too many choices are often as good as no choice at all. On our recent trip to Colorado, Sarah and I visited three different record stores, and I got an idea for how to fold this new hobby into my website. I have now replaced the photo gallery I wasn’t really utilizing with a link to our family Discogs page which catalogs and highlights selections from our growing collection. It’ll be a bit before it is completely up to date, but cataloging my record collection is something this information nerd is enjoying a bit too much. Rock on! Photo from a 2008 visit to Rocky Mountain National Park. Spending President’s Day weekend road tripping with my wife in Colorado. Beer will be had, vegan food will be eaten, vinyl will be purchased, and Bob Seger will be rocked out to in Denver. Until next week! It has been a good winter (so far) in Utah, with regular storms that have snow pack totals above 100% throughout the state. As a result of monitoring the snow pack, I currently have mountains on my mind. Specifically, I am thinking a lot aobut a project I started in my early 20’s that involves summiting the 26 high county peaks in Utah (technically there are 29 counties in Utah, but three of the high peaks straddle county lines). To this point I have successfully made it up 19 of said peaks, and I have decided to dedicate blog space to documenting those past climbs, as well as those I intend to get to in the (hopefully) near future. So, for this entry (and my own reference) I am including a simple list of the high county peaks from highest to lowest, along with a tag for those I have made it up as of this writing. Here is to a year full of high elevation! * = Summited as of February 09, 2019. This April will mark the 36th anniversary of the Thistle Disaster of 1983-1984. Thistle was originally the name of a town located at the junction of Highway 89 and Highway 6 up Spanish Fork Canyon. 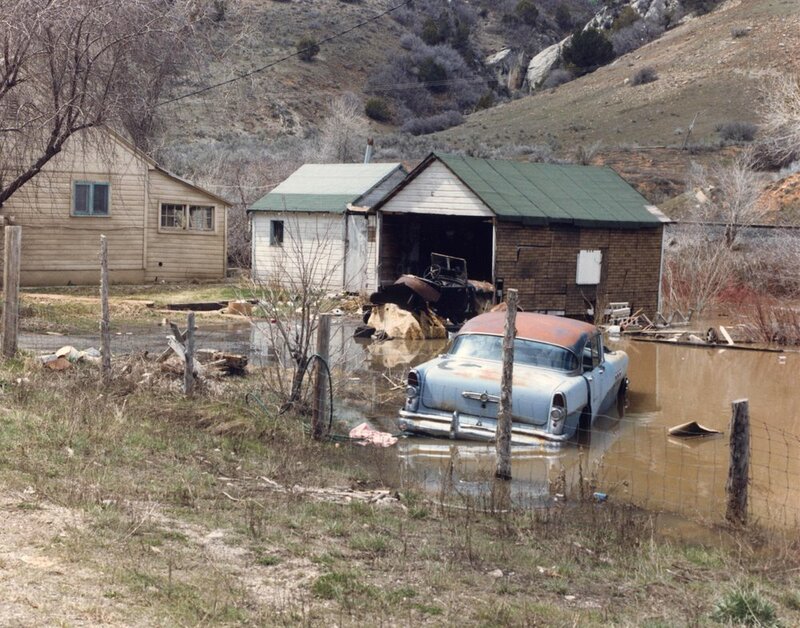 It became the name used to describe a massive mudslide which created a natural dam across the Spanish Fork River and destroyed the town of Thistle (along with large sections of railroad lines and highways). 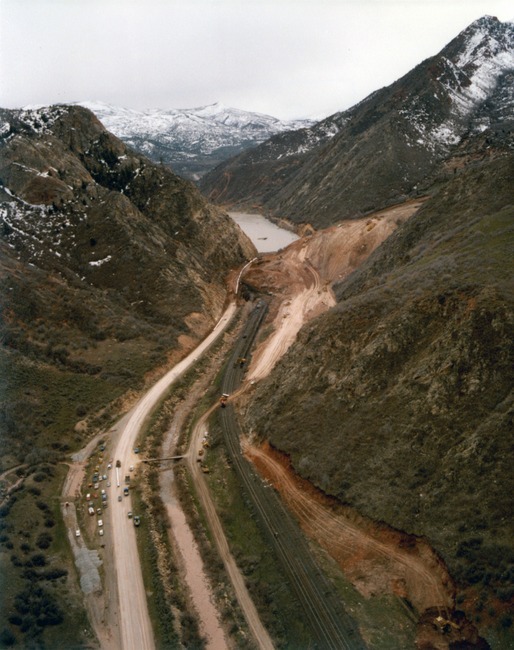 The story began in April 1983 when, after unusually heavy precipitation, Utah Department of Transportation crews responded to reports that shifting earth had left huge cracks in U.S. Highway 6. Not long after a giant mudslide, moving at 6-18 inches an hour, dumped more than one million cubic yards of earth over the highway and destroyed the Denver and Rio Grande western railroad line through Thistle. Highway crews were unable to save either the road or the tracks as the mud mountain continued its descent from early April into May. 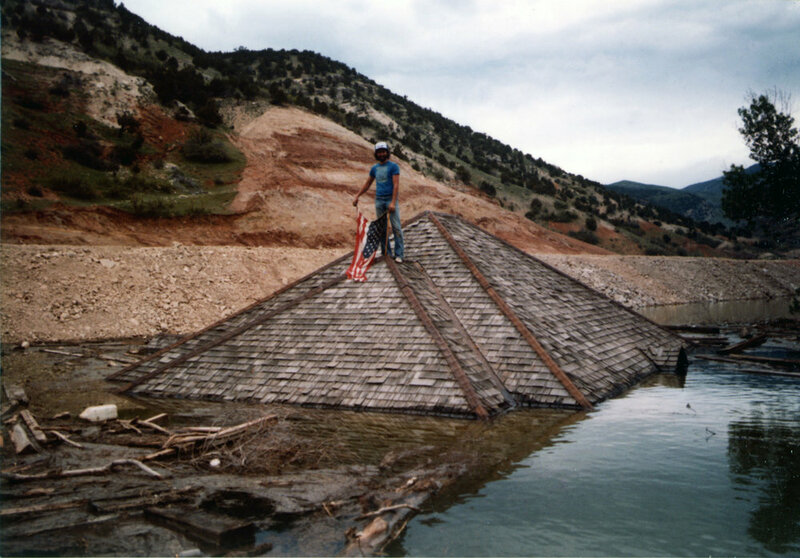 The massive slide created a natural dam across the Spanish Fork River, and the dam in turn created Thistle Lake, which completely submerged and destroyed the town of Thistle. The U.S. Corp of Engineers, the Utah National Guard, and construction workers from many companies joined UDOT workers in response to the Thistle slide. Efforts to control the slide turned to reconstruction of rail and roadways, and creation of a drainage tunnel to help bring down Thistle Lake. Several years back I had the opportunity to participate in a collaborative effort with fellow archivists from USU and SUU to build an online exhibit of various records and record collections relating to the history along Highway 89. One of my contributions was a collection of photographs of the Thistle disaster, taken in real time by the Utah Department of Transportation’s staff photographer. Recently I revisited that online exhibit and curated some photos that document the disaster as it was unfolding. Enjoy! Historic Thistle when it served as a stop along the D&RG rail line. Photo courtesy of the Utah State Archives and Records Service. Aerial photo of the mudslide, and Thistle Lake, at its inception in April 1983. Photo courtesy of the Utah State Archives and Records Service. Thistle slowly being submerged by Thistle Lake in April 1983. Photo courtesy of the Utah State Archives and Records Service. Thistle Lake rising in April 1983. Photo courtesy of the Utah State Archives and Records Service. Submerged buildings and American patriots on Thistle Lake in May 1983. Photo courtesy of the Utah State Archives and Records Service. Water diversion projects to drain Thistle Lake in June 1983. Photo courtesy of the Utah State Archives and Records Service. Creation of the new Highway 6 (left side of the photo) and new D&RG rail line in August 1983. Photo courtesy of the Utah State Archives and Records Service. Fall above Thistle Lake in September 1983. Photo courtesy of the Utah State Archives and Records Service. Workers digging out a new rail line at Thistle in November 1983. Photo courtesy of the Utah State Archives and Records Service. 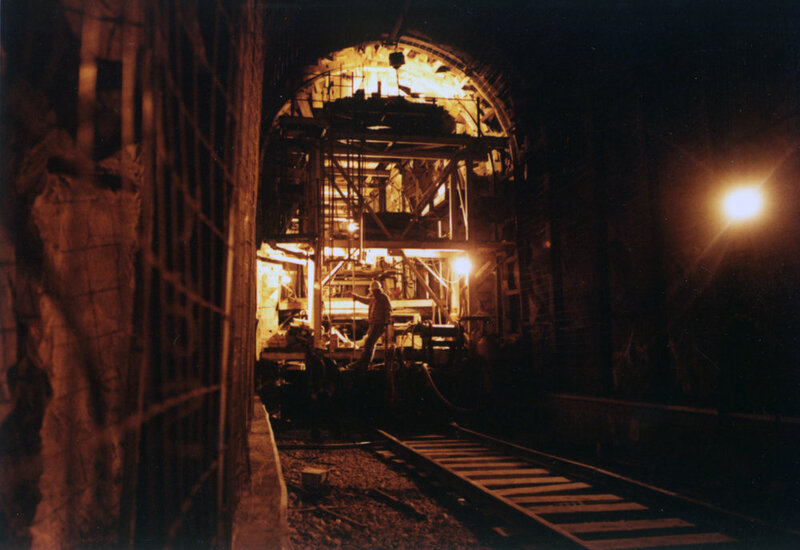 Outside the new railroad tunnels near Thistle in November 1983. Photo courtesy of the Utah State Archives and Records Service. 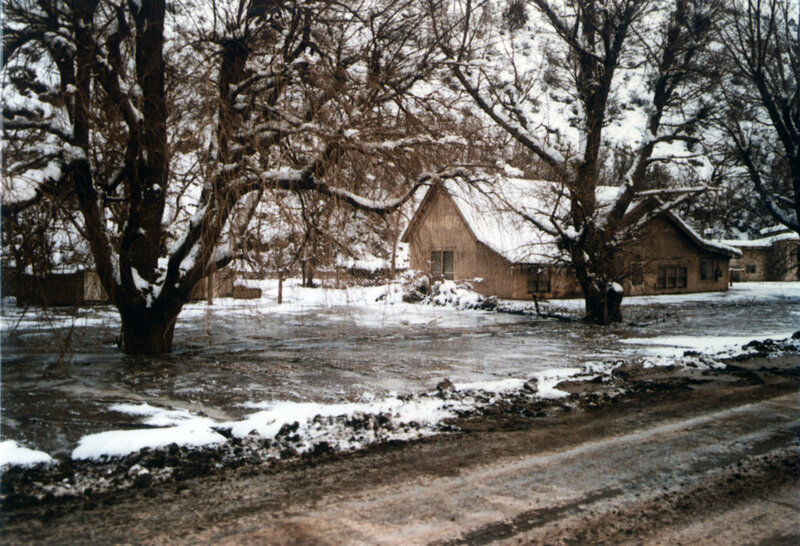 Winter comes to Thistle Lake in December 1983. Photo courtesy of the Utah State Archives and Records Service. The historic Thistle school house emerges from the waters in December 1983. Photo courtesy of the Utah State Archives and Records Service. More buildings emerge as Thistle Lake is drained in December 1983. Photo courtesy of the Utah State Archives and Records Service. Unnamed youngster taking in the full scope of the Thistle mudslide (and new corresponding infrastructure) in May 1984. Photo courtesy of the Utah State Archives and Records Service. 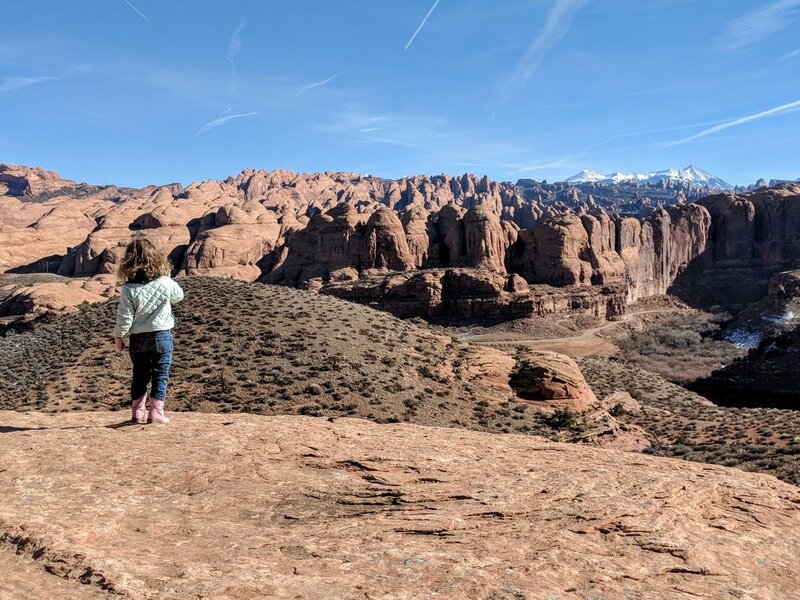 I spent last weekend hiking in the canyons around Moab with my wife, daughter, and our two bozo dogs (one of whom I had to rescue from a half-frozen pond after he tried an ill-advised rock jump). The MLK-weekend Moab trip has become a tradition in our family. It is one of the few times I can visit the Moab-area without getting anxiety from the influx of tourists. This year it was particularly quiet, which had us speculating that a lot of the winter visitors might have made other plans in the face of the government shutdown (in spite of the fact that efforts have been made to keep a handful of Utah’s national parks open). It was one of our better trips. Deserts remain deeply restorative and sacred. My daughter is old enough to hike on her own and she insisted that we get out as often as possible. We found some new hidden hiking gems, and had Corona Arch all to ourselves on our visit. Here are some pictures. Scene of my daughter taking it all in last January. No new content this week as the wife, kiddo, dogs, and I take our annual MLK-weekend trip to Moab. I’ll seek out pictures and stories for future blog posts while we are down there. Photo from Wikimedia Commons, the free media repository. I have made a concerted effort to steer away from making this blog overtly political. I have done this for two reasons. The first is that I want to make it as democratic and accessible to any and all who might stumble across it, regardless of whether we see eye to eye politically. The second is that I want the content to be as evergreen as possible, and hot political takes (usually made without anything close to full information) don’t tend to age very well. With that said, I can’t let the remarkable happenings currently going in Utah’s San Juan County go by without mention. 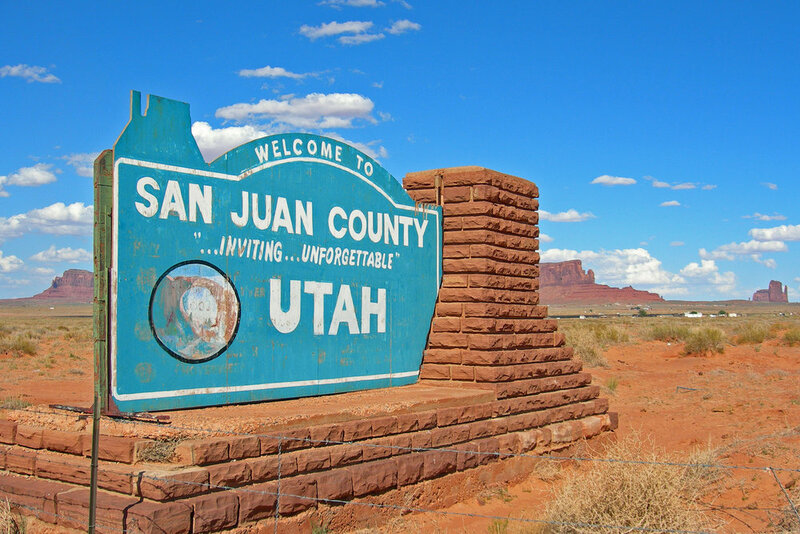 For the uninitiated, San Juan County is the largest of Utah’s 29 counties, with a land mass of 7,821 square miles. It is lightly populated (15,193 residents at the time of the last census) and home to some of the most ruggedly beautiful and iconic landscape in the American west. If you don’t know it, you actually probably do owing to the fact that it is home to Monument Valley. It is also home to national monuments at Rainbow Bridge and Natural Bridges, state parks at Edge of the Cedars and Goosenecks, Four Corners, Cedar Mesa, Grand Gulch, and the highly controversial Bears Ears National Monument. The unforgiving canyon country of San Juan County has been carved out over millennium by the Colorado and San Juan Rivers. It was the ancestral home of the Anasazi, who have left plenty of archaeological evidence of their presence behind. Today a large portion of the Navajo Nation sits within the boundary lines of San Juan County. Full-scale white settlement of the area came in 1879 when a group of Mormons set out from Escalante on the Hole-In-The-Rock Expedition. They arrived at the site of present day Bluff on April 6, 1880. Early attempts at ranching and agriculture along the San Juan River proved difficult, leading to the settlements of modern-day Blanding and Monticello in the (slightly) higher country near the Abajo Mountains. In several ways the economic story of San Juan County is a microcosm for Utah and serves as the locus for much of the angst over federal control of public land that now animates so many of Utah’s elected officials. Oil and gas exploration figures prominently into the history of San Juan County, as does the sordid history of Utah’s uranium mining boom that hit the state in the Cold War 1950’s. Yet, in spite of the persistent romance attached to extractive industry, it is tourism that is now central to San Juan County’s economy. So, with that (brief) backstory, it is easy to see why what has transpired in San Juan County over the last few months is so remarkable. In a county where the majority Navajo Nation has long been held in political check by a largely white Mormon minority, two Navajo’s, Willie Grayeyes and Ken Maryboy, were elected to serve on a San Juan County Commission during the last election cycle. This means that the county commission has suddenly shifted from being majority white and Republican to majority Democrat and American Indian. It is a historic moment, and a likely precursor to the types of sweeping change that will become more common with demographic shift and a (hopefully) more active and engaged citizenry. I find this quote striking for several reasons. It is clearly the perspective of someone who is facing unexpected change that has them feeling marginalized and scared. My first instinct is to dismiss it as divisive and baseless fear-mongering. But dig a little deeper and you can see how tantalizing close this unnamed Republican is to a transformative life experience. If they would just sit with that feeling they’re having and closely examine it, maybe they would come to see that what they are currently feeling is a direct analog to feelings long held by the Navajo residents of San Juan County (namely fear and skepticism that anybody is listening or representing their interests). In a place where change happens on a geologic scale, maybe this is what incremental progress looks like. This past Friday, January 04, Utah celebrated its 123rd birthday as the 45th state in the Union. Statehood Day usually goes by with little celebration unless it happens to fall on an anniversary or the same day as an inauguration. At the Utah State Archives we decided to do our part by putting together a small program and original record show-and-tell in the State Capitol. Prepping for it gave me the chance to brush up on some of my early Utah history, and I wanted to dedicate this blog post to the history and records that led to Utah’s statehood. Utah’s long and weird path to statehood began when the first Mormon migrants entered the valley and laid down settlements in the Salt Lake Valley in 1847. Within two years this small group submitted the first of what would eventually become seven (!) applications for statehood. The Federal Congress took one look at Utah’s 1849 petition to create the State of Deseret and determined that there were too few people residing in too large of a proposed area for statehood status. The congress did take the step, however, of granting territorial status on Utah which allowed for the creation of territorial government, and a territorial delegate to represent the new Utah Territory in Washington D.C.
Utah’s hilarious 1849 attempt to incorporate most of the interior west within the boundaries of the State of Deseret. Image courtesy of the Utah State Historical Society. As time past, more and more of the territorial appointments in the new Utah Territory were given to outsider, non-Mormons. 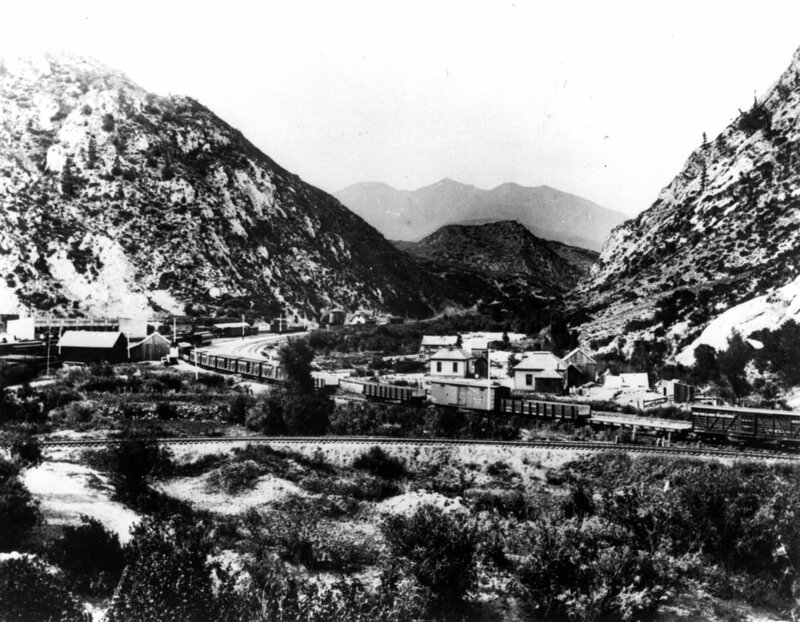 This led to resentments among the Mormon population of Utah, which, coupled with a growing non-Mormon population brought to the territory by mining, immigration, and the railroad led to renewed attempts to petition the feds for statehood status. Petitions were made in 1856, 1862, 1872, 1882, and 1887. All met the same fate in being denied, primarily because of the ongoing practice of polygamy among Mormons in the territory. The list of Federal legislation targeting polygamy is nearly as long as the number of failed applications for statehood. It includes the Anti-Bigamy Act of 1862, the Poland Act of 1874, the Edmunds Act of 1882, and the Edmunds-Tucker Act of 1887. This last piece of legislation was the most far-reaching in its attempt to end polygamy and break up the power of the LDS Church in the Utah Territory. It upped fines and jail sentences for those found guilty of polygamy. It dissolved the corporation of the LDS Church and confiscated all church property valued over $50,000. It created new layers of territorial government targeted directly at breaking apart the nebulous ties between church and state in the territory. And, interestingly, it ended women’s suffrage in the Utah Territory, which had passed by popular vote in 1870. Anti-polygamy sentiment manifested itself in other areas as well. In 1879, the U.S. Supreme Court ruled in Reynolds vs U.S. that the practice of polygamy as fulfillment of a sacred duty was not protected by the 1st amendment. With Edmunds-Tucker, the U.S. Marshall and his deputies in the territory began enforcing the new law and its strict penalties leading to mass arrest and incarcerations of known polygamists. Idaho was granted statehood in 1890 with a state constitution that featured a provision specifically targeted at keeping practicing polygamists from voting or holding office. With the church in dire straights, and on the verge of financial collapse, LDS church president, Wilford Woodruff, responded with an 1890 manifesto against the continued practice or preaching of polygamy. Men imprisoned for polygamy at the Utah Territorial Prison in 1888. Image courtesy of the Utah State Historical Society. By the time of the Woodruff Manifesto, the demographics in Utah had changed radically from the misfit band of Mormon settlers who had first entered the valley in 1847. With the assumed collapse of polygamy (spoiler: it took years for it to really leave the church), and the real collapse of a political framework in the territory that had effectively created secular and sectarian political parties, the time was right for another attempt at statehood. In December 1893 the territorial delegate for Utah, Joseph L. Rawlins, recommended a bill for Utah statehood in the Federal Congress. 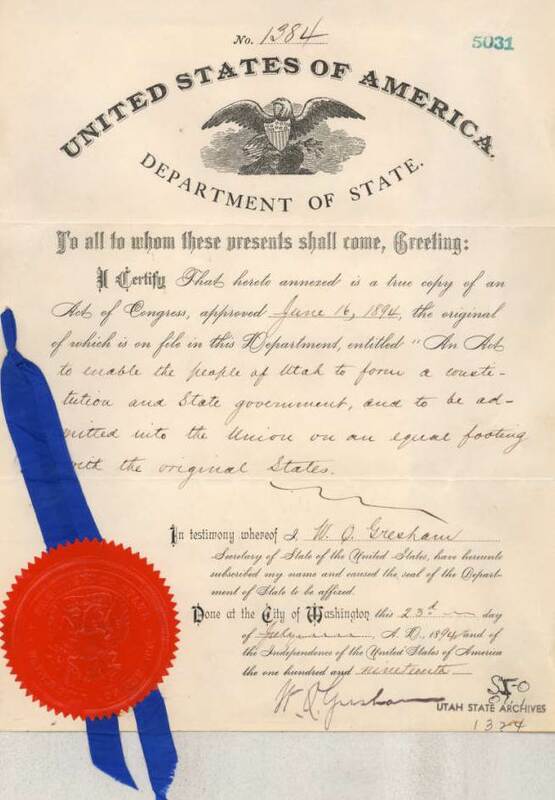 It passed both chambers, which led to President Grover Cleveland signing the enabling act for Utah statehood on July 16, 1894. The enabling act authorized the people of the territory to: elect delegates to a state constitutional convention; draft a state constitution; and elect officials to fill roles within a new state government framework. Utah’s 1894 Enabling Act. Image courtesy of the Utah State Archives and Records Service. In November 1894 the process was started with the election of delegates to a state constitutional convention. 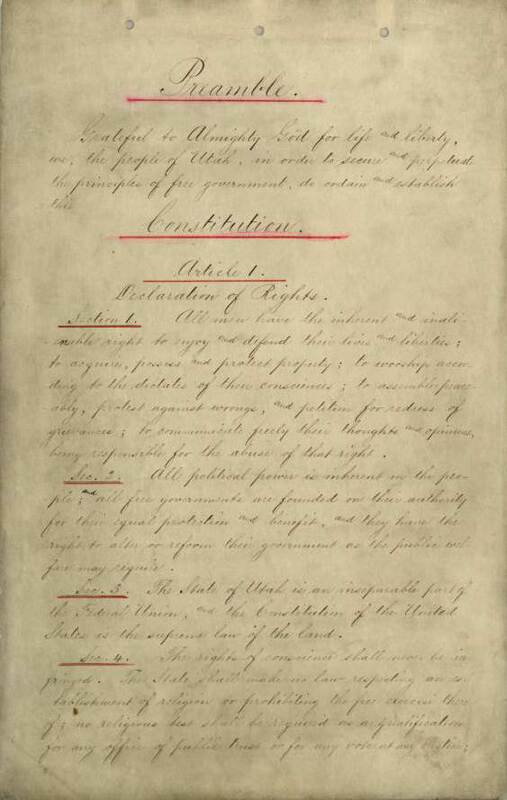 The constitutional convention met in the Salt Lake City and County Building between March 4th and May 8th of 1895, and produced Utah’s State Constitution. Interesting facets of this founding document include a provision that forever prohibits the practice of polygamy in the state, a guarantee of perfect toleration of all religious sentiment, a call for schools to remain free of sectarian control, and a provision restoring women’s suffrage within the new state. 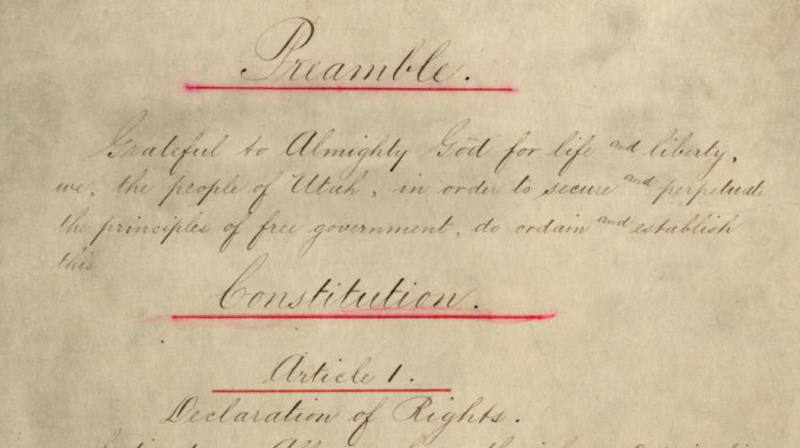 Preamble to Utah’s 1896 State Constitution. Image courtesy of the Utah State Archives and Records Service. In the November election of 1895 the people of Utah voted to ratify the new state constitution and elected officials to serve in newly proposed state offices. The Utah Commission certified the election results and made a formal recommendation for statehood to Federal officials in Washington. Utah entered the Union as the 45th state when President Grover Cleveland signed the Utah Statehood Proclamation on January 4, 1896. When news of the signing was received businesses shut down and there were celebrations in the street. Two days later, on January 6th, formal celebrations took place with the swearing in, and inaugural address, of Utah’s first statehood governor, Heber M. Wells. The only free image that shows up on Wikimedia Commons when you search “2019.” It seems appropriate. On the cusp of the calendar rolling over into 2019 it seems appropriate to take a minute and reflect on the successes I’ve had with my website this year (as well as express some of my intentions for the new year). First off, this year has to be considered a wild success simply because I finally started delivering content into the framework I have spent ample time building out. The bookshelf section of the site is up to date, and I’ll be adding to it in real time as I finish books. My linked Peakery site is also up to date, though I intend to flesh out each of my summit posts more in 2019. And, I have been successful in putting out blog content every Saturday since July. With all of the other moving pieces in my life this one feels like a genuine success. It has become part of my weekly practice, and I aim to keep it as such. So, what is in store for 2019? Well, as I already mentioned, I plan on keeping book and summit info updated in real time. I also plan on beefing up my photo gallery. In addition to adding more images I want to move the whole thing into a new platform that is prettier than Flicker. Haven’t landed on the exact solution for that just yet. As for my blog, it is my intention to continue delivering weekly content that explores the things I am learning and discovering during my time on Spaceship Earth. At the moment I’m thinking this might include some deeper, Utah-centric dives into the details that inform the weird and wonderful place I call home. Whatever shape it takes, it feels good to end 2018 on a website high note and to consider all of the potential that 2019 holds! The small southern Utah city of Kanab is in a state of slow moving flux. Located near the Utah-Arizona border this small enclave was once trumpeted as “the Hollywood of Utah.” Today the Little Hollywood Museum sits not far removed from the Parry Lodge which was built in 1931 to accommodate Hollywood production companies and actors who trekked in to tell stories reliant on the unique red rock landscape that surround this place. But times have changed and despite an identifiable civic pride in the towns colorful history Hollywood doesn't visit this dusty corner of the southwest very often anymore. Instead, like most of Utah, Kanab’s economy has become increasingly reliant on the tourist dollars spent by recreational pleasure-seekers who have found it to be a handy stop in between Bryce Canyon (to the North), Zion Canyon (to the West), and the Grand Canyon (to the South). Movie memories in the form of photographs and mixed pieces of ephemera hang on the walls of several local businesses, but even these sites are giving way to the chain restaurants, hotels, and other assorted services that tend to grow rapidly in the wake of industrial tourism. In its own way this small Utah town provides a powerful example of the shifting and transitory nature of place. Exploring the divides between how place exists not only as a geographic, physically bound area but also as location for ascribed human value is of central interest to environmental criticism. Conceptually place has a variety of built in assumptions and implications. Theoretical treatments of place open dialogues and debate to a number of questions and issues in need of consideration. Without firm place-based attachments do people miss out on something essential to the human experience? How does place as a concept continue to hold value in the face of mass migrations and meshing of humans and cultures that have acted to blur formerly held boundaries in our globalized world? And what does place truly mean in the context of a highly constructed and visual culture? Many ecocritical approaches acknowledge the broadness and multiplicity of place, and it is often positioned against the idea of space as a way of framing. Lawrence Buell offers one general conceptualization wherein space merely exists as environment that lacks any ascribed human meaning. In this sense “up to a point, world history is a history of space becoming place” (63). This anthropocentric view presents place as a subjective phenomena. Because of this place must reckon with temporal forces that keep it from being a static “thing” and instead render it inherently unstable. As time passes place is subject to change and a centrally located issue becomes how it retains its relevancy in the face of inevitable alteration. Edward Casey argues that places are “something in process, something unconfinable to a thing. Or to a simple location. Place is all over the place, not just here or there, but everywhere” (337). An obvious point here is that regardless of its specific conception there are uniquely human feelings, ideas, and emotions tied to the development of a sense of place. This is to say that place has something uniquely human ascribed to it that acts to differentiate it from any other place (or space) on the planet. But what of this issue of living in a wholly unique time in the history of our species when (via technology) we are able to “visit” and conceptualize places that we never actually enter into physically? And what to make of places that even more sinisterly have never truly existed? It is an issue that takes on special import within a globalized context. This blurring of boundaries that comes with globalized living troubles the issue of place further. In his argument for more versatile and adept conceptions of nature and ecocriticism, Timothy Morton pays specific attention to the idea of place as it has been traditionally understood in ecocritical thinking. Morton’s meditation leads him to wonder “what if globalization…revealed that place was never very coherent in the first place?” (170). This idea takes on special resonance in a world where the primacy of visual images in discourse has become increasingly ubiquitous. In a global context, (where images and ideas find immediate, widespread use) one critical question becomes what kinds of places are finding their way into the cultural imagination? Films from the Western genre serve as a unique opportunity to explore this issue of place and some of its potential ramifications in a global setting. Western films are unique in their construction in that they are situated in a specific temporal location, but generally have little else to with the complex historical realities that lay at the heart of the place or time they are conveying. Being both ahistorical and simulacra, the Western genre has offered writers and filmmakers a wide pallet on which to paint their ideas. Central to this argument is the unique role environment plays in Western film narrative. As Lee Clark Mitchell points out “the landscape celebrated consistently in the Western [offers] opportunity for renewal...it always signals freedom to achieve some truer state of humanity” (5). In this respect the Western has a facet similar to many forms of nature writing that focus on particular insights and epiphanies that are assumed to only come through a retreat from civilization and a return to corporeal contact with nature. Furthermore Mitchell argues that “the joining of body and landscape persists as a central dynamic of the Western...because it helps define an ideal of masculinity” (173). But through this fusing of environment, characters, and ideals the Western place become a culturally constructed area riddled with a variety of conflicts and issues worthy of consideration. Under critical assessment troubling questions about this culturally constructed “Old West” arise. Do the touchstone films of the Western genre convey certain shared values such as self-sufficiency, pragmatism, and heroic (mostly male) virtue? Or do these films perpetuate myths of white male dominance and the inevitability of Westward expansion? Do Western films offer an idea of “progress” that acts to justify and perpetuate hegemonic beliefs that are of central concern to many environmental and social justice theories? Contrasting the modernist film making of John Ford with that of postmodernist Sergio Leone demonstrates some of the central issues that trouble this idea of Western place. As important cultural touchstones they also provide a springboard into the analysis of contemporary projects that deal in many of the same tropes, environments, and ideas and force us to more deeply consider the complexity of place construction and whether or not they are truly areas we should esteem as a source of shared cultural value. The malleability of place and its fractured implications are on full display in the Western films of John Ford. Over the course of a career that spanned six decades, and produced 54 Westerns, Ford relied heavily on the dramatic landscapes and natural architecture of Monumental Valley (on the southeastern Utah-Arizona border). As the distinctive landscape came to play a recurring character throughout his Western films a question becomes how iconic and fixed they are in the public's mind as the primary environment of “the West.” That Ford was fully cognizant of the importance of the geographically fixed Monument Valley in the construction of his narratives is evident when he states, “I think you can say that the real star of my Westerns has always been the land…I have been all over the world, but I consider [Monument Valley] the most complete, beautiful and peaceful place on Earth” (qtd. in Florence 37). This thread was picked up and perpetuated further by Ford's biographer, Andrew Sinclair, who wrote that “the landscape is truly part of Ford's technique in translating the Western into legend” (D'Arc 208). But obviously a cinematic narrative is not just a series of fixed images, and it is the thorny junction of environment, characters, attitudes, and events that become fertile ground for ecocriticism and social justice theory. That John Ford was a modernist filmmaker is revealed in his reliance on narratives that convey a “grand narrative” that assumes the implicit rightness and progress of its protagonists. One way to conceptualize the meanings and motivations of Ford in this context is to consider three separate films that rely on the distinctive environment of Monument Valley as situated environment. Examining Fort Apache (1948), The Searchers (1956), and Cheyenne Autumn (1964) provides evidence of the troubled and conflicting aspects of John Ford's culturally constructed "West." Fort Apache is a loose adaptation of the historical loss suffered by General George Custer at the battle of Little Big Horn. Starring Henry Fonda and John Wayne the film tells the story of brash Colonel Owen Thursday (Fonda) who oversees a U.S. Calvary unit in a mythical Western setting fabricated in Monument Valley. His low opinion of the neighboring Apache tribe and refusal to listen to the experienced advice of Captain York (played by Wayne) eventually leads to conflict and a suicidal military order that gets many of his men killed in battle. The film is unique in its portrayal of the hostile Indian nation as being something slightly more nuanced than violent savages, as they end up sparing the life of York who they esteem as an honorable warrior. However, the ultimate motivation of the film is not to provide critique of the complex and troubled relationship between U.S. military forces and Indian tribes, but rather a glorification of the regiments who died in battle. In this way it conveys a sense of the inevitable “rightness” of U.S. military expansion in the West and perpetuates a frontier myth that has deep, troubling roots in American culture. Made eight years after Fort Apache in the same Monument Valley locale, The Searchers is far more disturbing in its overtly racist sentiment toward Indians. It stars John Wayne as Ethan Edwards, a man on a mission to hunt down a Comanche raiding party who has kidnapped his niece (Natalie Wood). Over the course of his five year search he has determined that the point of his mission is not rescue, but rather to kill the niece who he assumes has been fully assimilated into the Indian way of life. He is joined in his search by an adopted nephew Martin (Jeffery Hunter) who is part Indian. The overt racism exhibited by the Edwards character, particularly positioned against the attitudes of his young nephew, speak to the racially divisive context of 1950's America in which the film was made. Ford's portrayal of Indians in this film is far from nuanced or sophisticated which is fairly ironic as Ford was inducted as an honorary member of the Navajo tribe during its filming (D'Arc 217). At the end of the film Edwards rescues his niece and returns her to her family before walking off into the wilderness while a door literally (and metaphorically) slams shut on his receding image. This last shot is conflicted in its message, particularly in light of Ford's quoted views on Indian conflict. One could argue that in this final image Ford is making a comment that the attitudes and ideas of an elder generation portrayed by Wayne are coming to an end. However, Ford himself seems to refute this reading when he states, “the Indian didn't welcome the white man...and he wasn't diplomatic. We were enemies and we fought. The fight against the Indian was fundamental to the story of the West” (qtd. in Libby 286). Such a position speaks to a limited conception of the true cost of Westward expansion as well as the complicated historical context that lead to conflict. But, as Ford had a unique means to convey his particular beliefs and attitudes in the rhetorically forceful combination of word and image (and that said product has found international audience within a globalized context) the troubling implication of Western place becomes all the more significant. Finally consider the curious example of Cheyenne Autumn which doubles as the final Western film Ford directed. It tells the story of a Cheyenne Indian tribe moving from a reservation in Oklahoma back to their ancestral lands in Wyoming. The U.S government perceives this move as an act of aggression and the film becomes an interesting commentary on failed U.S. policies toward Indian tribes as well as something of a departure for Ford in his usual treatment of Indians. Cast in a much more sympathetic light the Indians of this film are tragic figures that come closer to representing the noble savage trope that has a long history of use in the Western literary tradition. Traditionally the noble savage is a member of a vanishing (or lost) civilization who is imagined as having fundamental insights into ways of living peacefully and in harmony with each other (and nature) that have been lost in the face of colonial conquest and the march of progress. Positioned against the attitudes conveyed in Ford’s earlier films Cheyenne Autumn stands distinctively apart. And with the iconic landscape of Monument Valley once again serving as background it creates a very different conception of place than that provided by either Fort Apache or the Searchers. So, what do these examples show about the modernist vision of John Ford’s West? Critic Jon Tuska contends that one of Ford's greatest flaws is found in his troubling treatment of Indians and the way “he couched his racism behind a facade of apparent paternalism” (61). By relying on members of the Navajo tribe in Monument Valley to fill in an assortment of Indian roles in his films one could argue that Ford's interest had absolutely nothing to do with conveying the customs and complexity of indigenous culture in a historically accurate sense. Another criticism that can be leveled at Western films in general (and Ford specifically) is their uneven treatment of women. Positioned against virtuous, heroic male characters Tuska argues that “that the roles assigned to women have been invariably prescriptive. All we can learn about women from the vast majority of Western films is what roles the patriarchy felt they ought to play, and nothing at all of the roles they really did play on the frontier” (235). However, these challenges to Ford are balanced against the technical skill and ability he had in creating “pictorial splendor and images of memorable composition and striking beauty” (Tuska 61). This visual component is certainly under heavy consideration in understanding how these stirring images and ideas have constructed and maintained a certain perspective of the West as a specific place in the cultural imagination. John Ford’s West is unique in that it is a place of numerous characters and ideas often positioned against the same unchanging backdrop of Monument Valley. Critical analysis opens his films to the question of whether his portrayals reflect the rugged individualism, pragmatism, and self-reliance often associated with the Western hero. Or do said portrayals feed into Western hegemonic assumptions about assumed power relationships (between both sexes and cultures). Furthermore, in his treatment of native populations does Ford perpetuate a myth that reinforces the “rightness” of white settlement in the West? These are all troubling questions that suggest how the kinds of place presented in the Western film genre are conflicted and open for valuable ecocritical analysis. Now consider the examples of a West in which the same formal elements and conventions that are a hallmark of Ford are used in wildly different ways (and in exotically distinctive locales). The spaghetti Westerns of Italian filmmaker Sergio Leone provides a premium example for comparison. As Neil Campbell posits in The Rhizomatic West, Leone's work provides a clear turn towards postmodern film making in the Western genre. Working outside of the American Hollywood system afforded Leone the opportunity to create Western film narratives that are familiar in their design but wildly different in their meaning and implications, in effect “creating rich and playful texts that...delve into and analyze established ideologies, iconographies, and histories of the West” (119). One example of Leone's ability to create a fractured sense of seemingly recognizable place is found by contrasting the iconic actor he often relied on (Clint Eastwood) against the figure so often associated with John Ford (John Wayne). In such Ford films as Stagecoach (1939) and She Wore a Yellow Ribbon (1949) the characters portrayed by John Wayne tend to demonstrate the rugged individualism and myth of heroic male virtue that are central to Ford's modernist vision. Balanced against the equally iconic Man With No Name characters portrayed by Clint Eastwood in the Leone classics A Fistful of Dollars 1964), For a Few Dollars More (1965), and The Good, The Bad, and the Ugly (1966), the central aims of Leone stand out in sharp relief. The characters of Eastwood are mysterious, ambiguous, and morally conflicted. “The Man” (Eastwood) often places his own needs and self-preservation over any assumed nobility or sense of community (both of which find resonance as tropes throughout the mythic Hollywood West). Another point central to the argument of the ambiguity of place can be found in the simulacra environments of Leone that convey a place called North America, but that were in actual reality created an ocean away in areas of Spain and Italy. That these films have found reverberation with a worldwide audience and effectively convey a sense of the mythic North American West in question speaks to the shifty nature of place. This postmodern effect of knowingly twisting formal elements (such as environment) is played with to even greater effect by Leone in his masterpiece Once Upon a Time in the West (1968). In this film he pays homage to the film making of Ford by traveling to America and utilizing many of the same environments that Ford drew upon (including Monument Valley). However, as Neil Campbell explains the use of this environment is done while telling a story that is both similar in form and completely different in tone and meaning to a classic Hollywood Western (123-129). In the film Henry Ford is cast as the villain (an ironic choice as he was the tragic hero Tom Joad in Ford’s 1940 Grapes of Wrath) who is found working for an unscrupulous railroad baron. The “progress” and “connections” associated with the railroad and its assumed virtue in helping settle the West is presented as a conflicting element in Once Upon a Time in the West and in this way it presents a complex example of a filmmaker creating a new vision of place with wildly different expectations and outcomes than the type that has deep roots in the American cultural imagination. Working firmly outside of the Hollywood system offered Sergio Leone the opportunity to reimagine and reconstruct the West in provocative and powerful new ways. That Leone considered himself firmly outside the American context that produced traditional Westerns “permitted...a unique 'outside' vision to emerge” opening up “a critical dialogue asking questions about the West as history and representation” (Campbell 149). This “participation without belonging” afforded Leone the opportunity to establish dialogism with the Western film genre in which he borrowed key themes, imagery, and ideas while alternately employing them in ways that offer powerful critique to American attitudes and assumptions that lie at the heart of the formal Hollywood Western. His critiques seemingly embrace subversive attitudes toward the assumed virtue of the male hero, the promise of inevitable progress, and the prescribed roles of various groups including women and Indians. Lee Clark Mitchell contends that the films of Leone “clearly spoof the classic Hollywood Western” and that the genre provided him “with a recognizable structure that freed him to express a surreal sense of dismay at the genre” (239). In this respect the spaghetti Westerns of Italy provide a fractured sense of Western place that offer a variety of challenges to the kind constructed by American filmmakers like John Ford. The questioning, rebellious nature of Leone's film and the ways they subvert and challenge assumptions that underlie many Hollywood Westerns fit well into the chaotic social context of the 1960's in which they were produced. It can be argued that they have ultimately proven more enduring over time than their American counterparts, and it is the effects of this fractured West offered by Leone and how his postmodern reinterpretations have found echo in the contemporary popular culture that we now turn. A central question becomes how the West has evolved and changed in the cultural imagination since the Westerns of John Ford and Sergio Leone. While the genre has seemingly lost popularity (as evidenced by the sheer decline in the number of Westerns made on a year-to-year basis) the familiar forms and tropes continue to find use. One offbeat example of a deconstruction and mocking of the “Old West” imagined by filmmakers like John Ford is found in Mel Brooks’ 1974 comedy, Blazing Saddles. Filmed in California ten years after passage of the American Civil Rights Act, Blazing Saddles creates an ironic western place in which Bart (Cleavon Little), a black man, is made sheriff of the fictional town of Rockridge. The film ironically deconstructs notions of the rightness and inevitability of white progress and Westward expansion by portraying a black protagonist who ultimately proves wiser and more sophisticated than any singular white character in the film. In fact, the white characters of the film are largely portrayed as menacing brutes or bumbling idiots (while the Jewish Brooks makes one brief cameo as an Indian Chief!). In these ways Blazing Saddles presents a narrative that satirizes many of the assumptions and stereotypes that are central to copious American Western film narratives. Another way to look at this twisting perpetuation of complex place is to turn to the Western films of Clint Eastwood, specifically his award-winning, Unforgiven (1992). Throughout his Western films Clint Eastwood demonstrates the profound influence working with Sergio Leone had upon him. This influence finds ultimate form in the story of his highly conflicted character, William Munny. Through back story we learn that Munny is a notorious killer who has tried to leave his past behind him and fashion a new family life as a frontier farmer. He is lured back into a world of violence by a reward being offered by a brothel of prostitutes who are looking for justice after violence is done on them by two passing cowboys in the fictional town of Big Whiskey. Throughout the film Munny is conflicted and at odds with the violent past he has tried to leave behind and the hope for a better life he can offer his children with the reward money. The film also provides an interesting and complex treatment of its female characters. The prostitutes of Big Whiskey show a greater degree of nuance than women are generally afforded in Western film, and the sense of community that exists between them ultimately proves stronger than almost any other human relationship portrayed. Much like the work of Leone, Eastwood recycles formal elements from the Western genre and in doing so presents a narrative that supplies a greater degree of sophistication in its treatment of Western place. And as the example of Sergio Leone’s Italian-produced Westerns demonstrate, the forms and tropes of the genre have the potential to be lent vibrant new life outside of a strictly American context. One powerful example of this is found in Australian filmmaker John Hillcoat’s 2005 film, The Proposition. Taking place in the “wild West” of the 19th century Australian outback the narrative focuses on a morally conflicted criminal named Charlie (Guy Pearce) who is offered a pardon from his life of crime if he is willing to help colonial English forces track down his outlaw brother Arthur (Danny Huston). Couched in a historical era that is every bit as complex and conflicted as that of the American West, the narrative deftly moves between characters and imagery that are instantly recognizable as key to the Western genre. To escape the law of colonial forces Arthur has taken to the outback and found refuge with aboriginal tribes of the area (an indigenous group of human beings whose real life history of pain and persecution is remarkably similar to that of the American Indians). Ultimately Charlie kills his brother Arthur, leaving the viewer with a divergent set of emotions. In one respect the elements of colonial force and “progress” are continually portrayed throughout the film as sinister and wrong (making the film similar to the postmodern ideas and commentary offered by Leone). However, by the end the motivations that lead Charlie to side with the agents of this progress and kill his “wild” brother Arthur are complicated and unclear. One interpretation may be that the text is attempting to convey a tragic sense of the inevitability of violence and the fracturing of human bonds (like brotherhood) in the face of massive global change. In this way The Proposition demonstrates a potent way in which the tropes, forms, and imagery associated with the Western genre can potentially be utilized in new ways to provide not only new conceptions of place, but also the ramifications of globalization. Films like this have the power to raise questions about the cost of civilization as well as the assumed inevitability of Westward progress, which, in turn, has had profound implications for American (and global) culture. One final example demonstrates how advancing technology has increased the number of available platforms for perpetuation of the fractured Western conceptions of place. With the 2010 release of the highly popular video game Red Dead Redemption on Xbox 360 and the Playstation 3, Rock Star Games introduced a new generation to many of the recycled elements and tropes that have helped inform a cultural sense of the West. Following a narrative thread that is more similar to the postmodern vision of Sergio Leone than the grand narratives imagined by John Ford, Red Dead Redemption relies heavily on a virtual construction of rendered environments that echo many of the Southwest locales that have become iconic and fixed in the cultural imagination. The protagonist of the game is a troubled anti-hero in the Eastwood tradition and the music and extended tracking shots used to establish mood and tone are hallmarks of Leone. Overall the game offers just one view of how Western place conception is finding new life, and thus why it is important to consider its construction and perpetuation in the future. Returning to the Vermillion Cliffs outside of Kanab, this is an environment that has seen heavy use as a filming locale, from decidedly Western epics like Clint Eastwood’s The Outlaw Josey Wales (1976) to the otherworldly science fiction of Planet of the Apes (1968). The wide open spaces and unique nature of the land make it a source of almost limitless possibility and imagination. Local history attests that this is the literal ground for almost inexhaustible storytelling opportunity, and couched in this framework the idea of place as it has been conceived, constructed, and portrayed in the Western film genre takes on crucial weight. As Noel Sturgeon argues in Environmentalism in Popular Culture, many of the frontier myths and tropes that were once pivotal to the Western genre are now finding new life in narratives that reach beyond the borders of our planet and into outer space (54-57). That the physical environments used to construct and portray these new alien worlds happen to be some of the same Southwest locales that formed many famous Western films brings the argument full circle. It underscores the complex and shifting nature of place as well as the vital role a sense of place holds for human beings. The unique demands of living in a highly technological and globalized context make it imperative that we are critically aware and continually push ourselves to imagine and construct places that are truly worth inhabiting. Buell, Lawrence. The Future of Environmental Criticism. Malden: Blackwell Publishing, 2005. Campbell, Neil. The Rhizomatic West. Lincoln: University of Nebraska Press, 2008. Casey, Edward S. The Fate of Place. Berkeley: University of California Press, 1997. D'Arc, James V. When Hollywood Came to Town: A History of Moviemaking In Utah. Layton: Gibbs Smith Publishing, 2010. Florence, William R. “John Ford...The Duke...And Monument Valley.” Arizona Highways September 1981: 37. Libby, Bill. “The Old Wrangler Rides Again.” John Ford Made Westerns. Ed. Gaylyn Studlar and Matthew Bernstein. Bloomington: Indiana University Press, 2001. 286. Mitchell, Lee Clark. Westerns: Making the Man in Fiction and Film. Chicago: University of Chicago Press, 1996. Morton, Timothy. Ecology Without Nature: Rethinking Environmental Aesthetics. Cambridge: Harvard University Press, 2009. Sturgeon, Noёl. Environmentalism in Popular Culture. Tucson: University of Arizona Press, 2009. Tuska, Jon. The American West in Film: Critical Approaches to the Western. Lincoln: University of Nebraska Press, 1985. 1947 CONCEPTION OF THE CENTRAL UTAH PROJECT (SERIES 200). PHOTO COURTESY OF THE UTAH STATE ARCHIVES AND RECORDS SERVICE. This is the third (and final) in a series of re-purposed blog posts written in my role as an archivist at the Utah State Archives and Records Service. These posts will illuminate the story of Utah’s role in the larger western movement to try and tame the Colorado River and use its waters for unprecedented development in the arid west. Due to circumstances of geology and demographics, the bulk of Utah’s population lives on the eastern edge of the Great Basin, hundreds of miles (and thousands of feet of elevation) removed from the Colorado River water promised to the state by the Colorado River Compact. In 1946 the first scheme for addressing this disconnect was conceived. 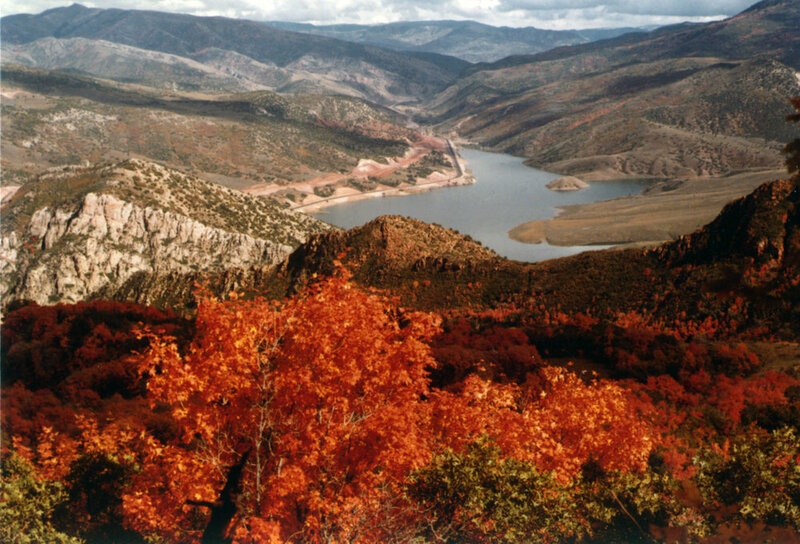 Modeled on successes by the Bureau of Reclamation in the early 20th century at Utah’s Strawberry Reservoir and nearby Heber Valley, local planners developed the concept of the Central Utah Project (CUP). 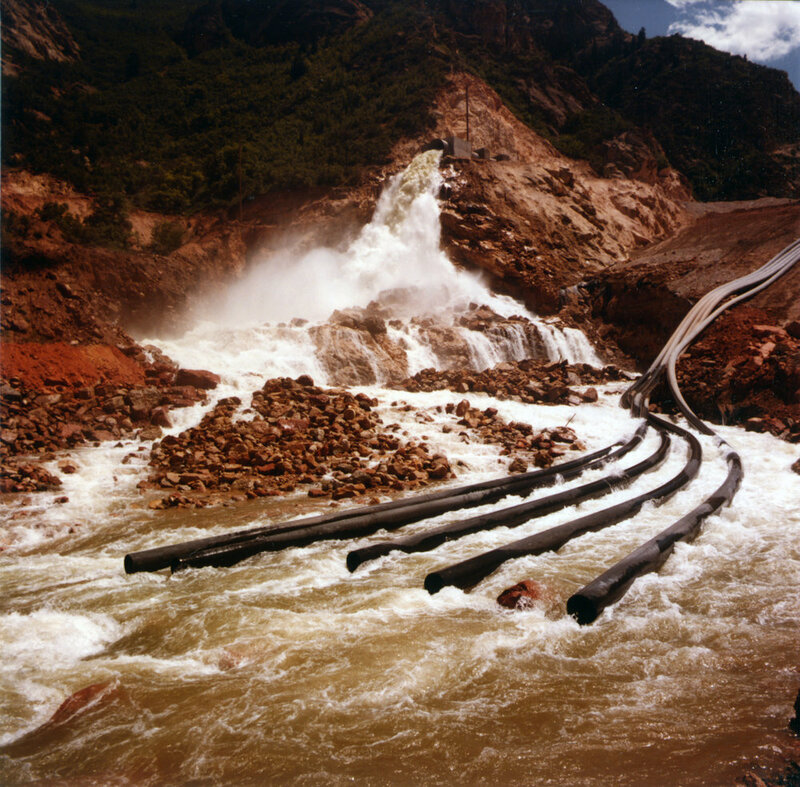 According to its proponents, the CUP would guarantee full use of Utah’s allotted share of the Colorado River by implementing a series of aqueducts, diversion and storage dams, and tunnels that would effectively move water from the eastern Colorado River Basin to other areas of the state, including the growing population centers along the Wasatch Front. The first attempt to create the CUP came in 1946 when federal legislation was proposed by Utah senator, Abe Murdock. This legislation was met with defeat, as it was determined that any attempt at such a massive project in Utah needed to be bound up with larger planning in the Upper Colorado River Basin as a whole. Up to that point, the states of the Upper Basin hadn’t even determined how the Upper Basin allotment would be divided between them. This, in turn, spurred negotiations that would lead to the 1948 Upper Colorado Basin Compact, an agreement that granted Utah 23% of the 7,500,000 acre feet of water apportioned to the Upper Basin by the Colorado River Compact. In that same year (1948), the Colorado River Storage Project Act (CRSPA) was also proposed. This legislative action proposed a comprehensive plan for developing the Upper Colorado River Basin. However, a variety of delay’s prevented the Congress from authorizing it until 1956. Upon its authorization, the Central Utah Project was born, effectively serving as the largest single participating unit in the CRSPA plan. This early history of the CUP’s origination and initial planning is reflected in records held by the Utah State Archives, which includes correspondence records from the office of Utah Governor J. Bracken Lee (1946-1956), as well as Colorado River Commission case files created by the Utah Attorney General. In simplest terms, the CUP serves to build the infrastructure needed to impound and transport water from the eastern Utah river basin to other water-starved regions in America’s second most arid state. The organizational apparatus for developing the CUP water delivery systems was born in 1964, with the legal organization of the Central Utah Water Conservancy District (CUWCD). The original seven-member board of the CUWCD was composed of one representative from each county in Utah impacted by CUP projects. This original board included members from the counties of Salt Lake, Summit, Wasatch, Utah, Juab, Uintah, and Duchesne. Later the board would expand to include representation from Garfield, Piute, and Sanpete counties. The CUWCD was established to both oversee the management of water projects associated with the CUP, as well as manage Utah’s repayment of federal funds that had been allocated for CUP projects by the Colorado River Storage Project Act. The CUWCD set to work by first organizing water development projects around the state into seven distinct geographic units: Vernal, Upalco, Jensen, Bonneville, Uinta, and Ute Indian. Setting project priorities and allocating resources has often proved contentious, particularly as projects went over time and budget throughout the latter 20th century. For example, in 1965 the Bonneville Unit (the single largest unit of the CUP) was allotted $302 million in funds to complete its associated water projects. Construction delays and the passage of time meant that, by 1985, over $2 billion in funds had actually been spent developing the Bonneville Unit. The early history of work done for the CUP, as well as ongoing debates of how to fund the project appear throughout several record series held by the Utah State Archives. These include Upper Colorado River project files from the office of Governor George D. Clyde (1957-1965), correspondence records from the office of Governor Calvin Rampton (1965-1977), natural resource working files from the office of Utah Governor Scott Matheson (1977-1985), and correspondence records from Governor Matheson’s office. 1968 CENTRAL UTAH WATER CONSERVANCY DISTRICT RIBBON CUTTING EVENT (SERIES 200). PHOTO COURTESY OF THE UTAH STATE ARCHIVES AND RECORDS SERVICE. Over time it became increasingly clear that the broad, ambitious goals of the CUP would be bogged down by both slow construction, as well as a lack of adequate ongoing funding and support from the federal government. Funding for the CUP (through the Bureau of Reclamation) was often a contentious point of debate among federal lawmakers, and the entire project was nearly defunded completely during the term of President Jimmy Carter (1977-1981). The tendency to stall or delay water projects ultimately led to an unprecedented action in 1992, when Utah’s state and local officials asked the federal government to turn over authority to complete all unfinished CUP work to the CUWCD. This request was granted with passage of the 1992 Central Utah Project Completion Act (CUPCA). This legislation authorizes the CUWCD to oversee completion of CUP projects, particularly those in the Bonneville unit which includes areas of exploding population growth along the Wasatch Front. In addition, the legislation provides a means for over-site and environmental mitigation of CUP work to be overseen by the U.S. Department of the Interior through a newly created CUPCA office. 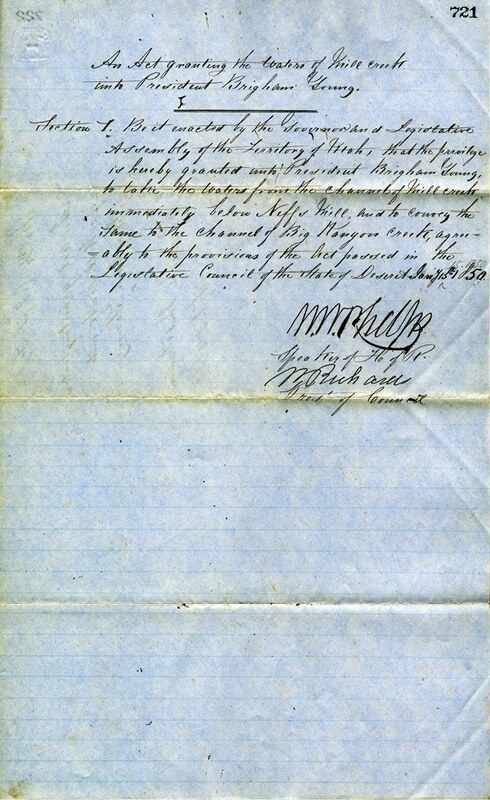 This climactic moment in the CUP’s history, as well as the negotiations that took place to secure passage of the CUPCA, can be traced in records held by the Utah State Archives, including Governor Norman Bangerter’s Washington Office records, as well as Governor Bangerter’s Chief of Staff correspondence records. 1968 CUP NEWS REPORT (SERIES 200). PHOTO COURTESY OF THE UTAH STATE ARCHIVES AND RECORDS SERVICE. The future of the Colorado River, and its millions of users, is a hazy one. How reliable will the river’s flow remain, particularly in the face of changing environmental conditions and exploding population centers in the western United States? Water allocations from the Colorado River have been re-calibrated at points in the past, based on lower flows and the fact that the original numbers agreed to in the 1922 Colorado River Compact were based on unusually (and unsustainable) high years of river flow. A similarly unknown future faces the major water storage projects along the river, including those that compose the Central Utah Project. Consider, for example, the unknown fate of the Hoover Dam, an aging structure holding back a dwindling water supply that is currently being drawn on by more people than at any other point in its history. Major questions concerning the Colorado River, and its use, face each of the western states that rely heavily on its water. Will the answer be a doubling down on the types of costly reclamation efforts that were meant to help the arid southwest “bloom like a rose?” Or will the answers increasingly take the shape of users learning how to more efficiently utilize the regions most critical resource? Whatever way the future flows, it is clear that the Law of the River is still, very much, a work in progress.